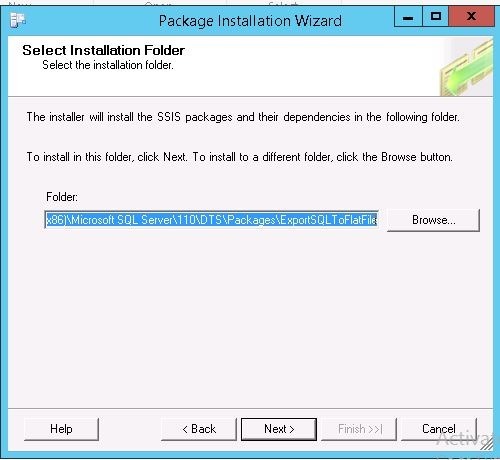 In the series of step by step SSIS learning, this is another interesting article. In this article we will try to implement PIVOT transformation in few easy steps. Let’s understand the PIVOT by below example. 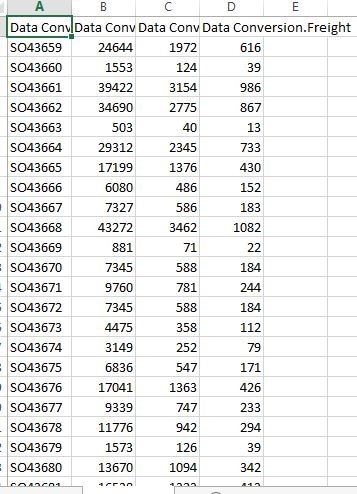 Suppose, you have a salary data of employee as shown below. Now, if our requirement is something like below table then we would require PIVOT functionality. 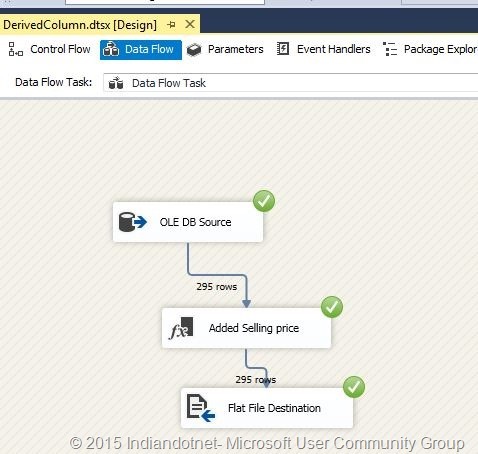 In general, we say when we want to convert Rows data to Columns then this is called Pivoting. 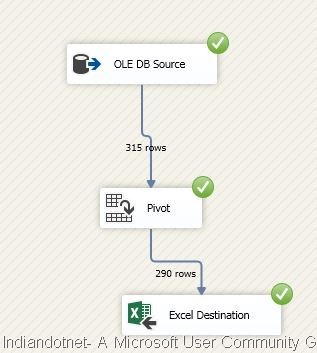 Now, lets create a sample of PIVOT transformation with few basic steps. 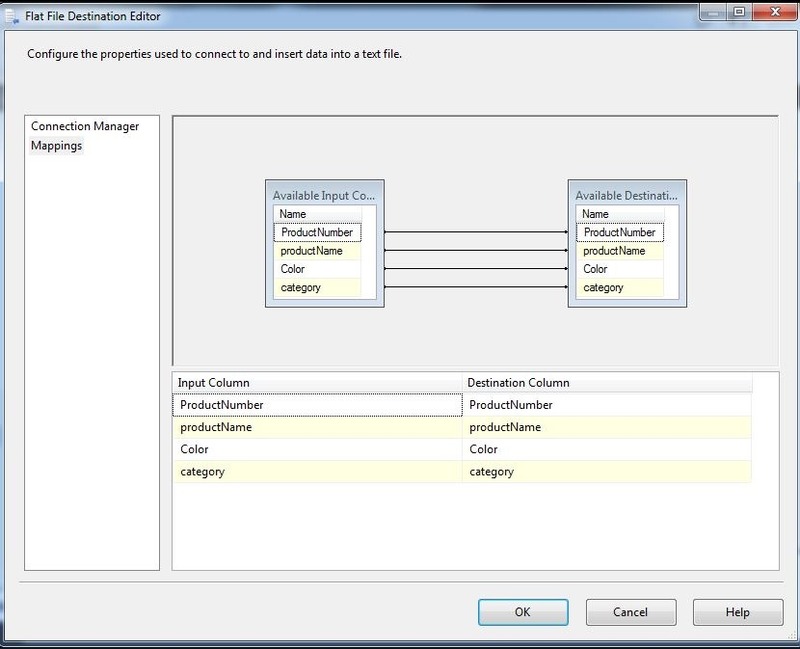 In this example, we are again using AdventureWorks database. EmployeePayHistory, Employee, People tables are base of our example. 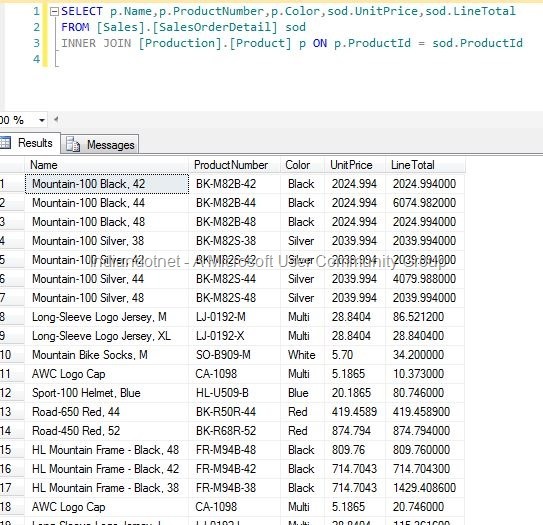 We wrote query which fetch data similar as shown above. 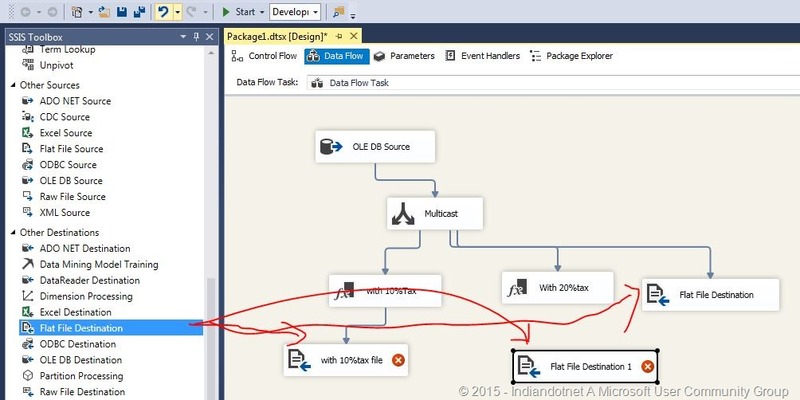 Step 1: Add a dtsx package and drag drop data flow task as show in below figure. 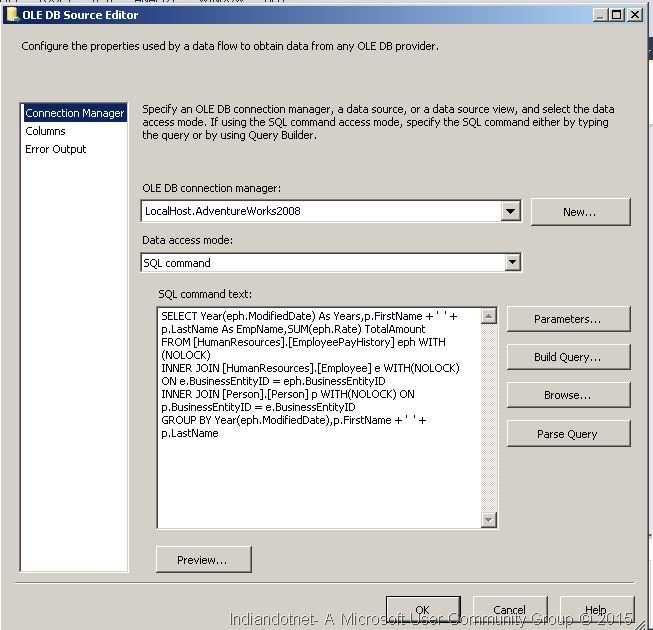 Step 2:- Now, double click on Data flow task and drag drop data source and select SQL Data source and configure the SQL statement as shown below. 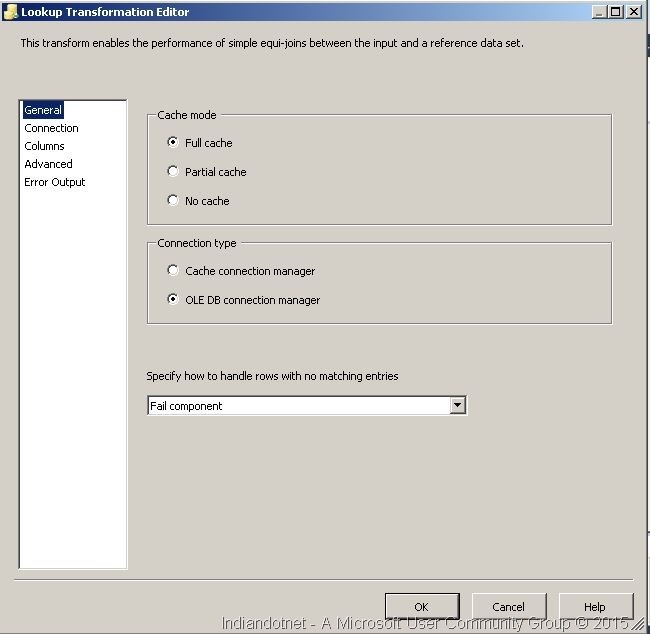 Step 3:- Now, We have to drag drop PIVOT transformation control as shown below. Step 4:- Now, we have to configure the PIVOT control. When you choose edit option then you will get the following screen. Here, we have to choose Pivot Key, Pivot Value and Set Key. In the Pivot Value we use the value which we have to show in the columns. If you see pivoted output columns highlighted in yellow in above image is the year wise columns. if you are sure for the columns which you want as a pivot columns then you can add the name of the columns in place of [value1],[value2] etc. and click on Generate Columns Now button. (In current case we have limited years so we have added  to  values in this textbox and clicked on Generated Columns Now button due to which we got yellow required Pivot output columns as highlighted yellow. Step 5:- Our configuration is not yet complete to configure this we have to click on advance setting and select Input and output properties. 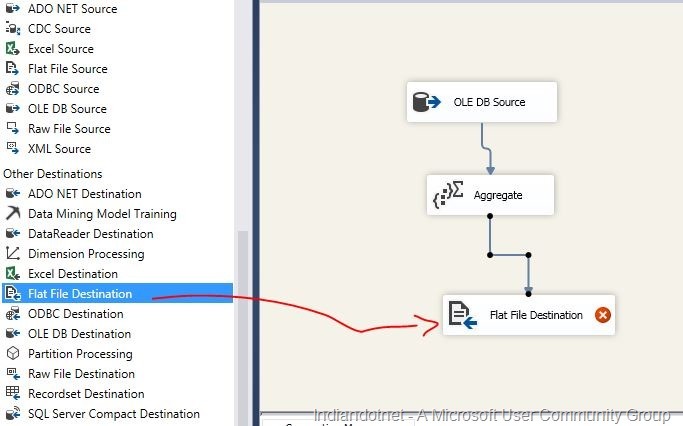 Step 6:- The another most important point is PivotUsage which is highlighted below. 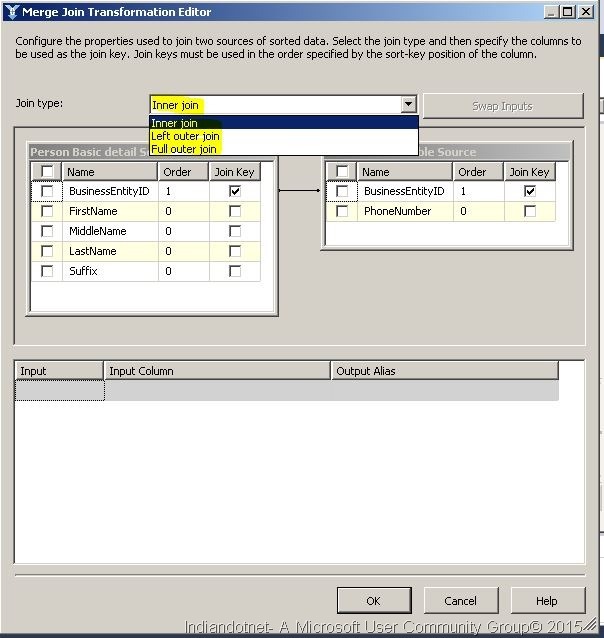 If we want to add columns which are not affecting the pivot then we have to update the value of PivotUsage to 0. 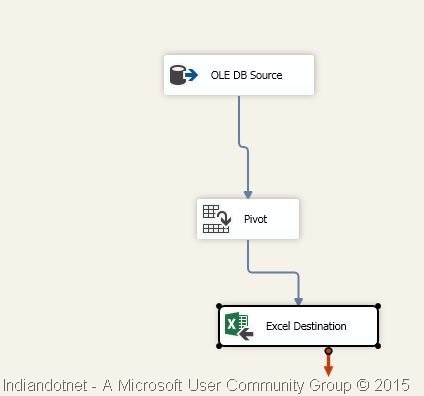 Step 7:- Once the Pivot is configure the next step is to provide the output of pivot to a destination. As a destination we are using Excel file as usual . 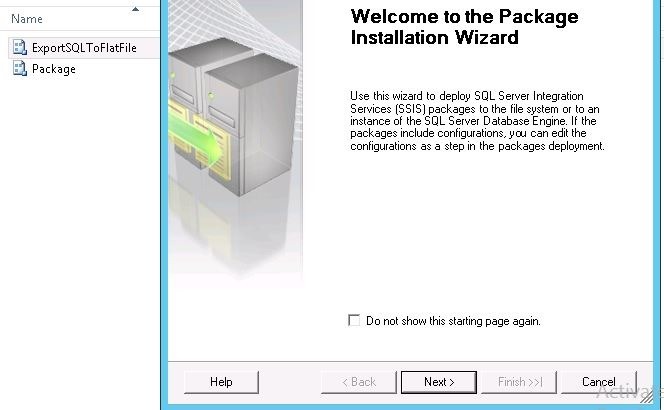 Step 8 :- Once the configuration is done we will see below screen. 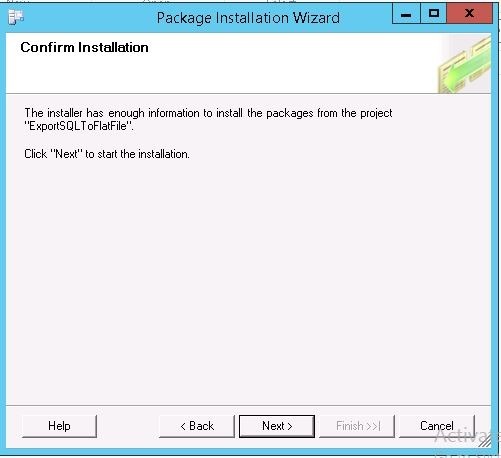 Step 9:- Now, once everything is completed then we run the package and we will get following screen. Now to cross check we open the excel and cross check the data. When we open the excel, we found desire result. So, We have achieved what we want. We did our first Pivot Transformation example. Please, feel to drop your comment. 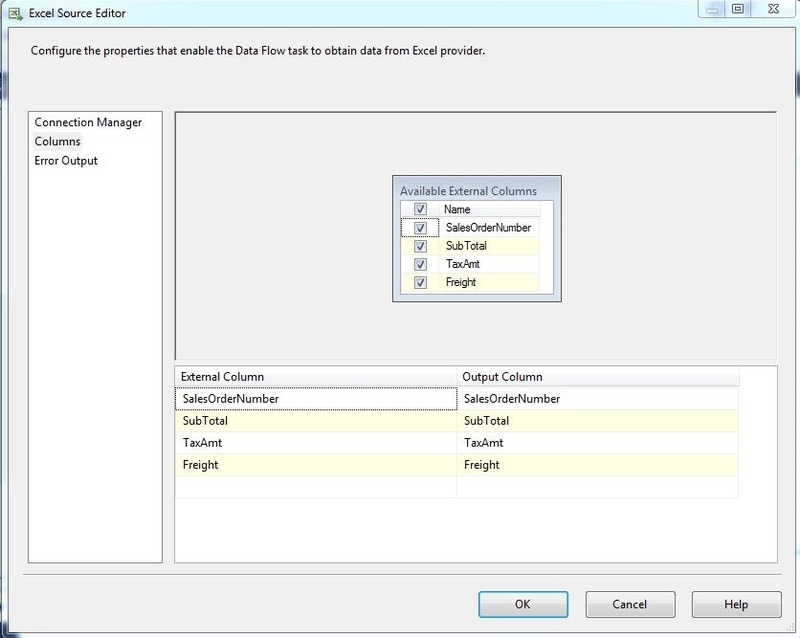 This is one the articles in the series of step by step SSIS tutorial. 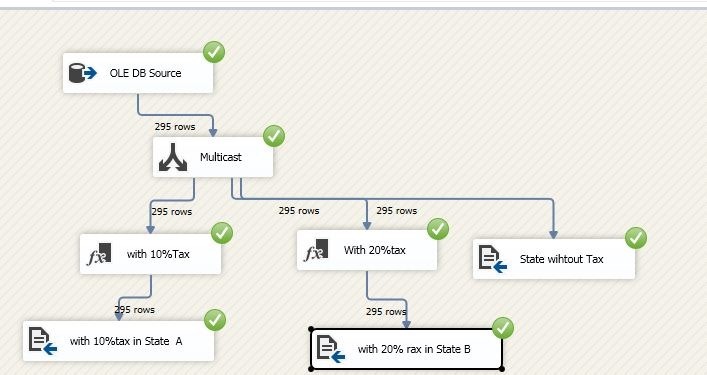 In this post, we are going to understand Lookup transformation and also see an example to implement Lookup transformation in 8 easy steps. 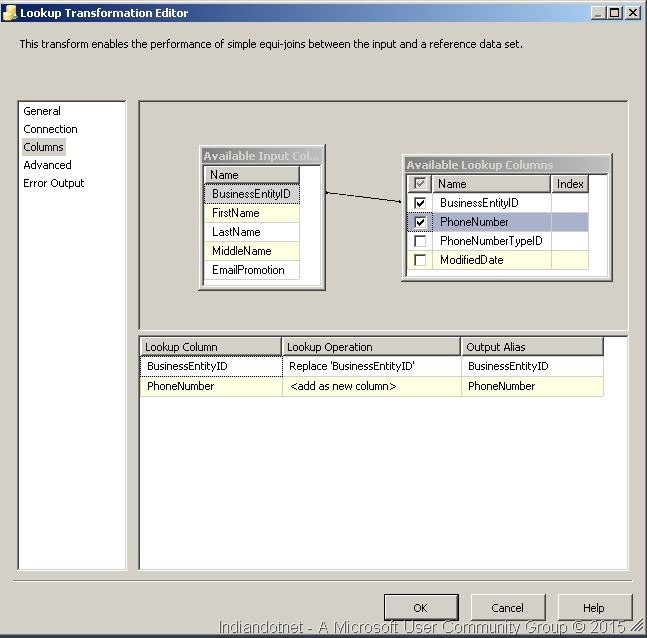 Now, Lookup transformation is one of the interesting transformation which is used to implement equijoin between data sources. We are discussing the same example which we discuss in the earlier post which is Person & PersonPone tables of AdventureWorks. Suppose, we want Person details and the phone number of person as a result then we can apply Lookup transformation. When, we applied the Lookup transformation between Person & Person Phone table then we will get two result set. One of the result sets is the Matched result set in which we will get the Person data and the First Matched Phone number while the PersonPhone table might have multiple phones for a person but we will get only one phone number record because Lookup transformation uses EquiJoin. In the second result set, we will get unmatched Person records which mean the Person who doesn’t has a Phone number in PersonPhone table. I think, we have a basic understanding of what is Lookup Transformation. Now, we are going to implement Lookup Transformation step by step. 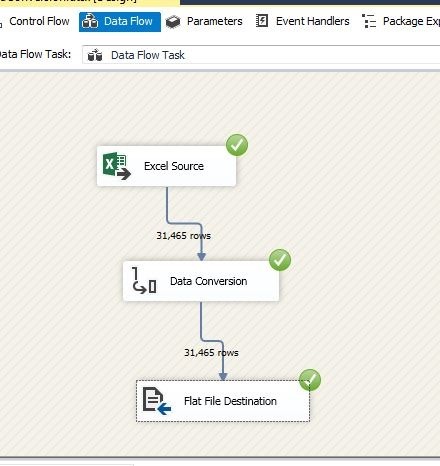 So, the first basic step is to add a package and drag-drop data flow task as shown in below figure. 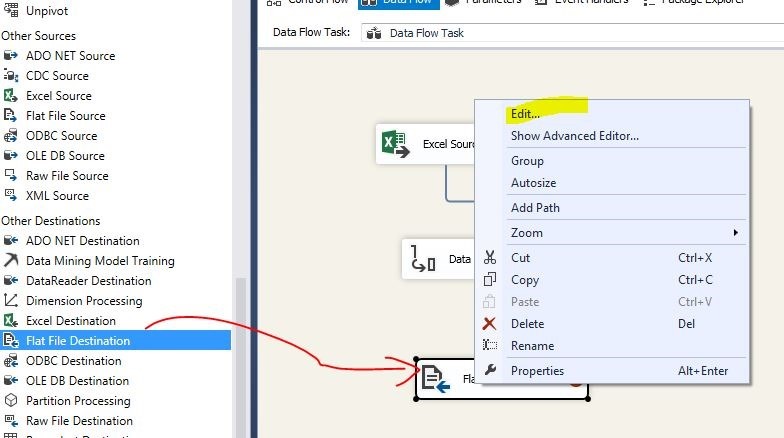 You can rename the data flow task as I did in below figure. Step 3:- Once the Person table is configured just drag drop Lookup Transformation control and provide the input of Person table Data source to Lookup table. When you try to configure the Lookup you will get the following screen. We will discuss Cache mode separately in detail. 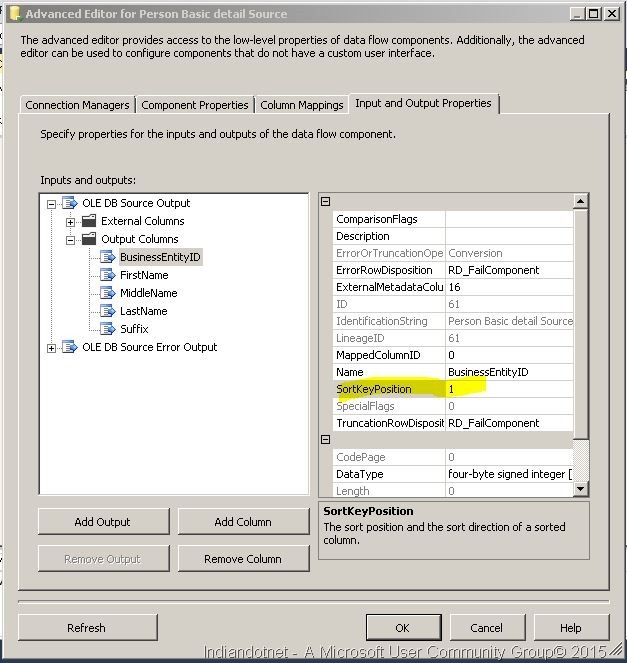 In this example, we are using Full Cache and connection type to OLEDB connection Manager. Now, Click on Connection option on the right and configure the PersonPhone table. Step 4:- Now, configure the Columns relationship between Person & PersonPhone table.To achieve this just drag-drop BusinessEntityId of available input columns of Person table to available Lookup columns which are in PersonPhone table and matched with BusinessEntityId which is common between Person & PersonPhone table. 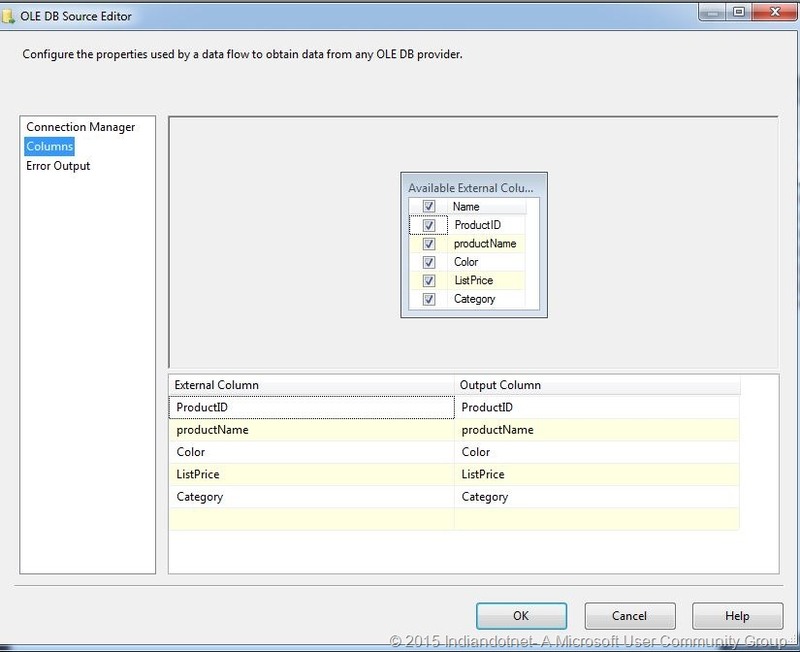 Here we have to select PhoneNumber column which we have to include in the result set. 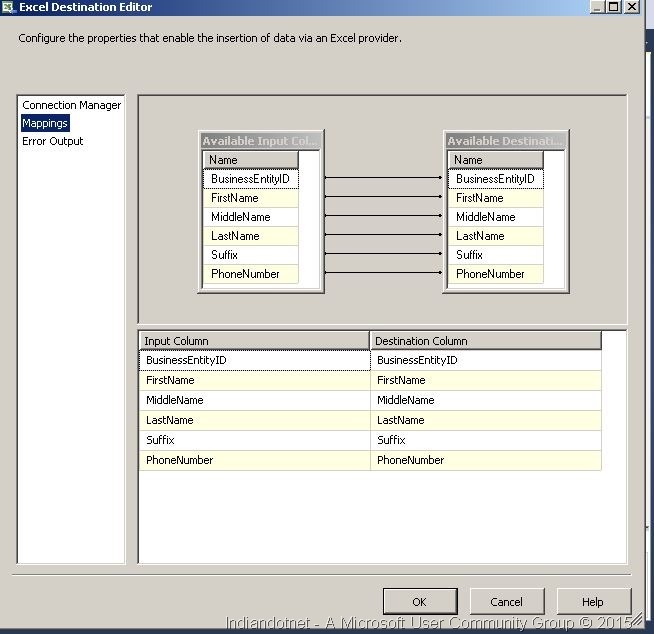 Step 5:- Now, Drag drop two excel destination source and configure it. As, I did in below figures. 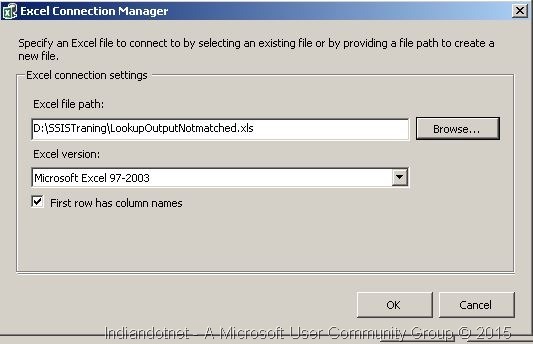 Here one Excel is with name LookupOutput.xls which contain matched records. Below, is another Excel which contains unmatched records. Here UnMatched means the Person records who don’t have phone numbers. 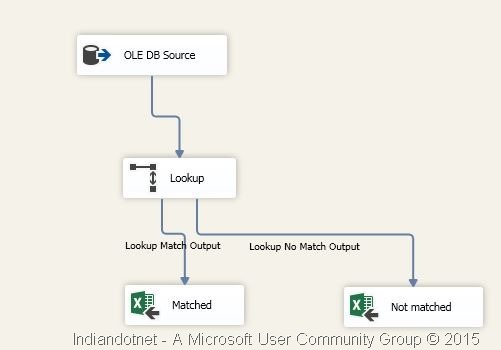 Step 6:- Now, If you see there are 3 output lines coming from Lookup transformation.So, First blue output gives it to Lookupoutput excel which will have all the matched records of person & Person Phone number. You can configure inputs as shown below. I hope above steps are easy and you can implement Lookup Transformation at your end too. 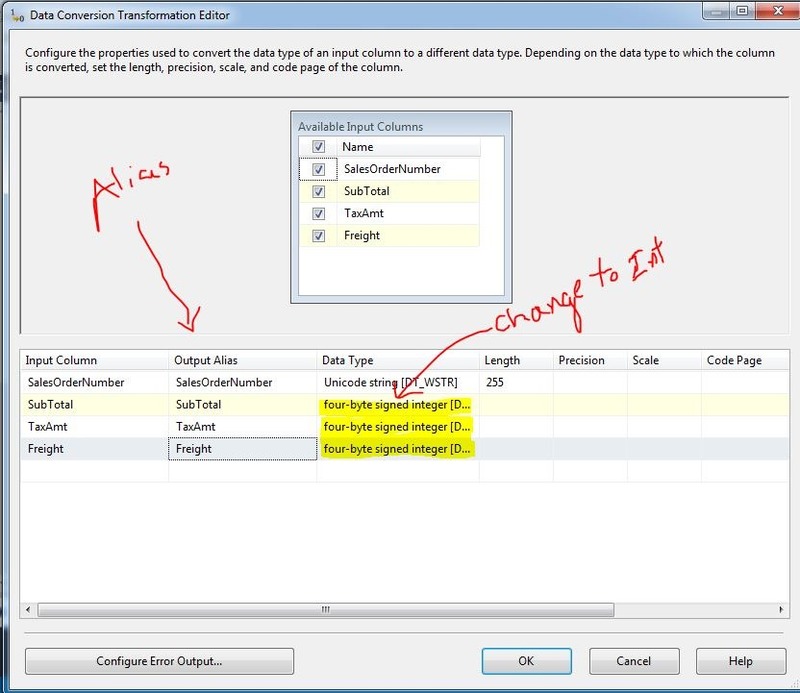 In last post tip #122, We discussed Merge transformation. Now in this tip, we are going to discuss Merge Join. Although, it might be confusing sometimes Merge & Merge Join. So, let me explain it here. So, Merge Join is basically a join like Inner join, Left outer join, Full outer join etc. Step 1:- Add the different sources which you want. For this example I am taking two sources which have AdventureWorks database and one source have Person table & another one have PersonPhone as shown above in the example. 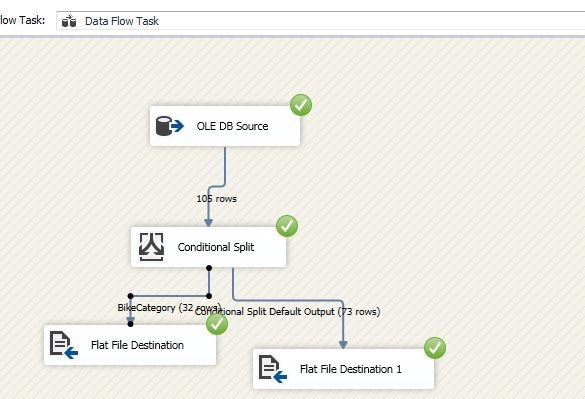 We added data flow task as shown in below image and renamed it to Merge join data flow task. Now, in this data flow task, we will add data sources, in the first source we use person table and in the second source we use PersonPhone. 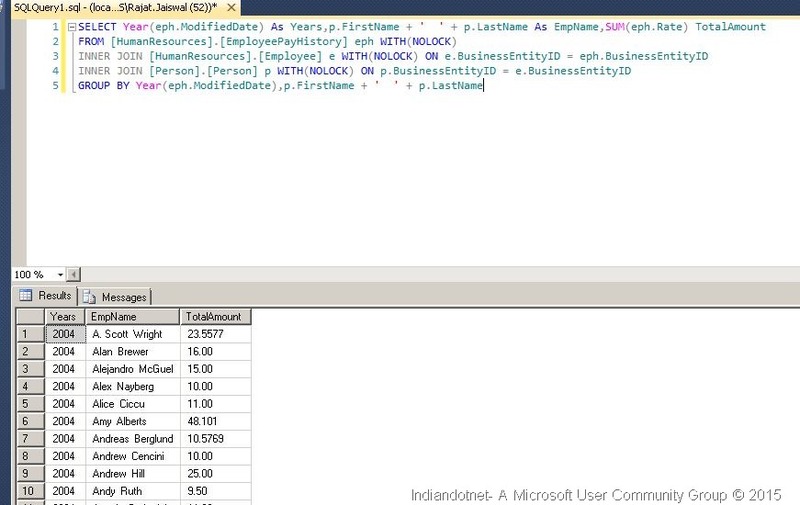 In the other source, we are using BusinessEntityId & Phone number columns. 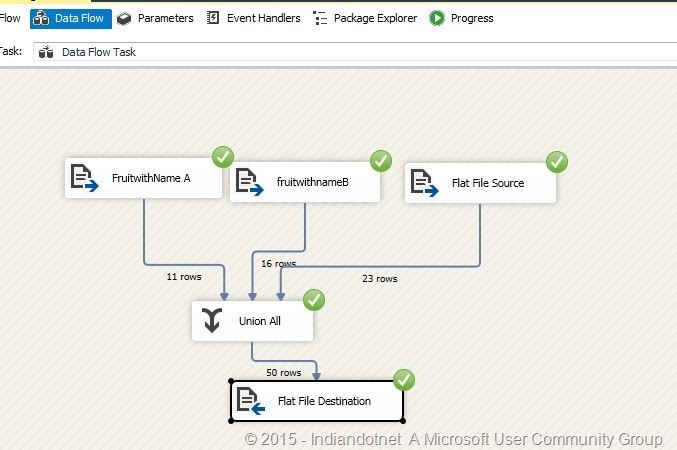 If you find any issue in above steps then please, follow previous articles of step by step SSIS on Indiandotnet. 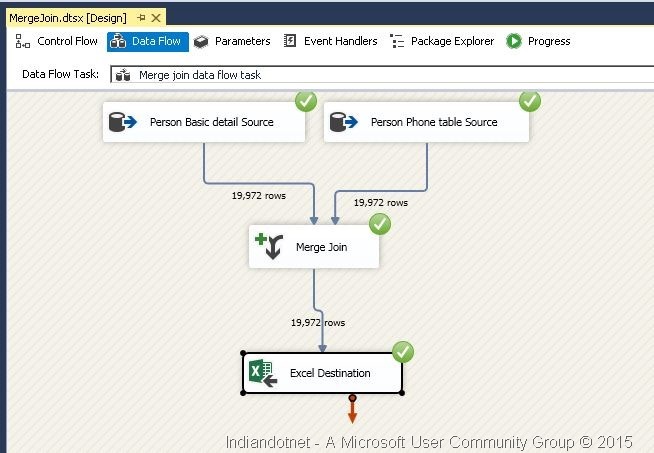 Step 2:- Now once the source is configured, we are going to drag drop merge control as shown in below figure. Step 3:- Now to configure Merge join, we are going to drag drop inputs from the sources. When you try this at your end then you will get the following screen. 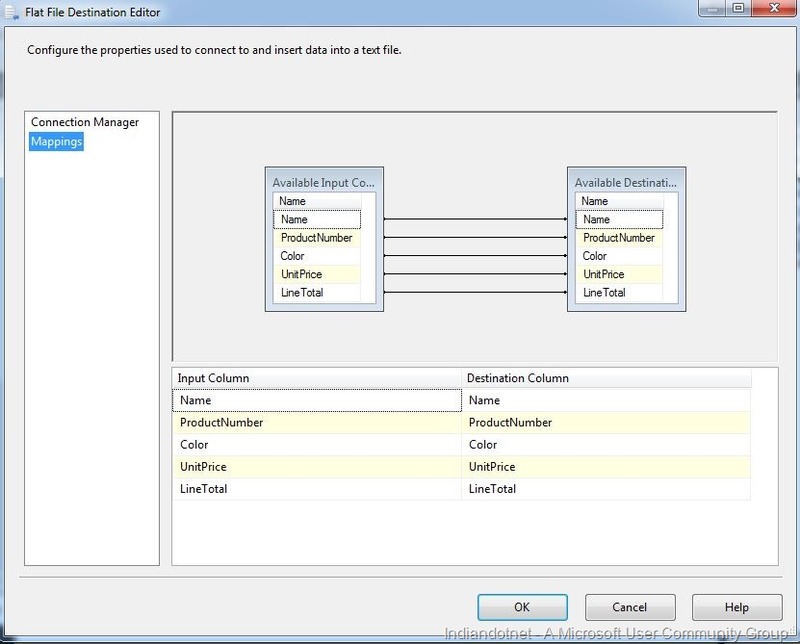 Here you have to set left input and right input for the merge join. Now, When you tried it you might found following warning. 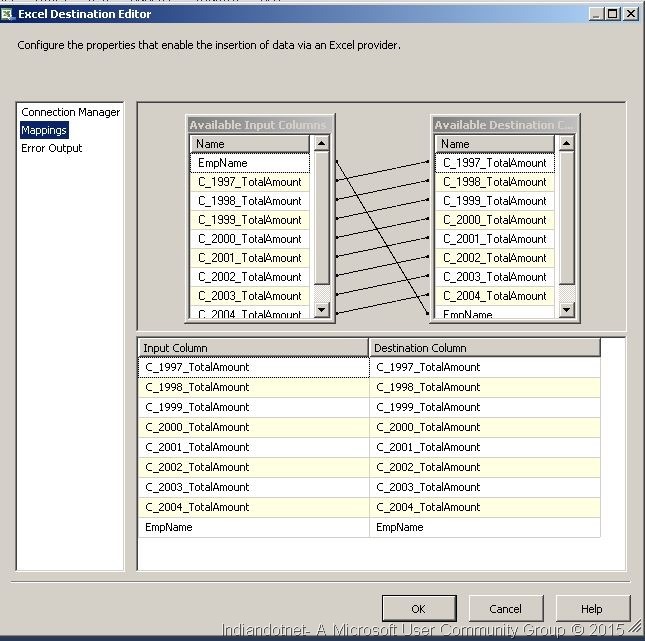 Which means the provided inputs of datasource1 & datasource2 are not sorted. 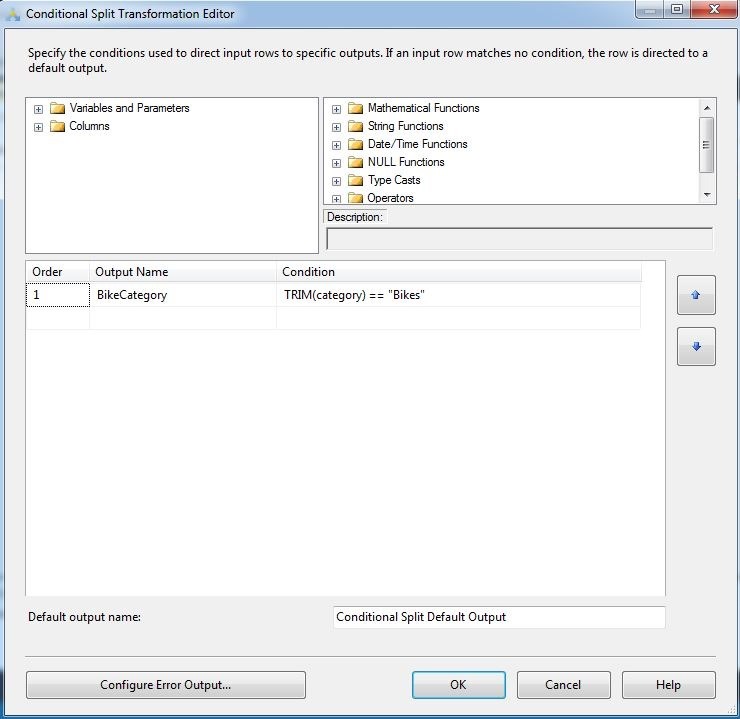 Step 4:- Here you have the option to add a Sort transformation and then provide input to merge join transformation control which is fairly simple and we have discussed in previous tips. Here, I am sharing one more option. 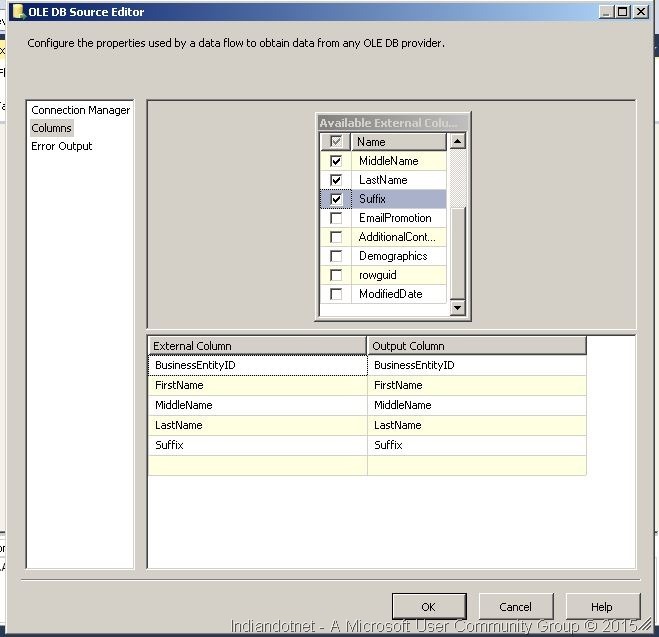 In this, you have to right click on DataSource and choose option Advance Editor by which you will get the following screen. 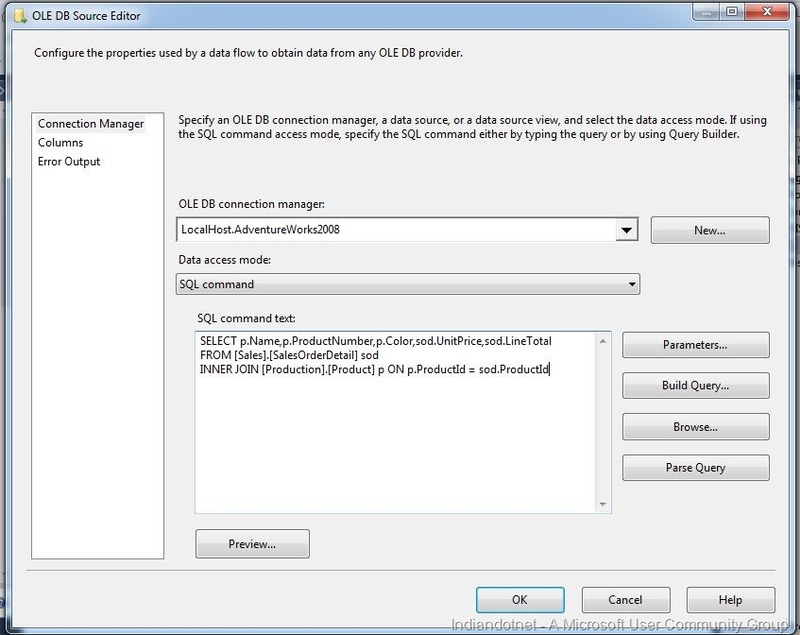 You have to select “OLEDB Source output” of “Input and output Properties” tab. 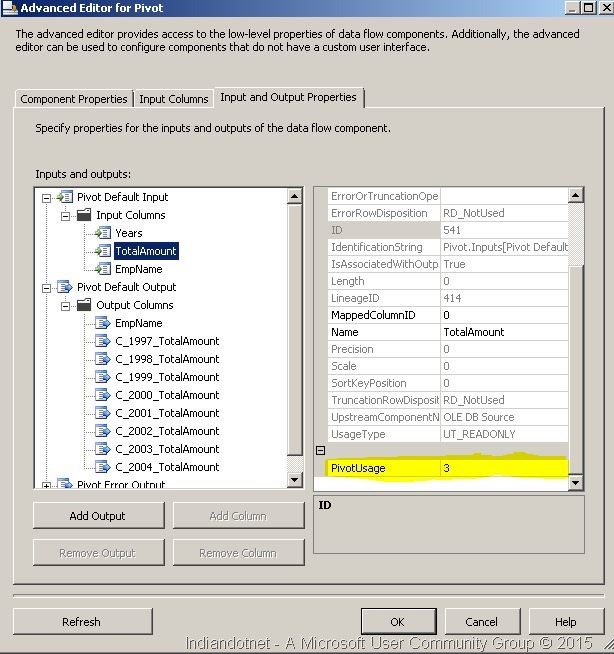 Here, we need to make the IsSorted property to True as highlighted in below snap. 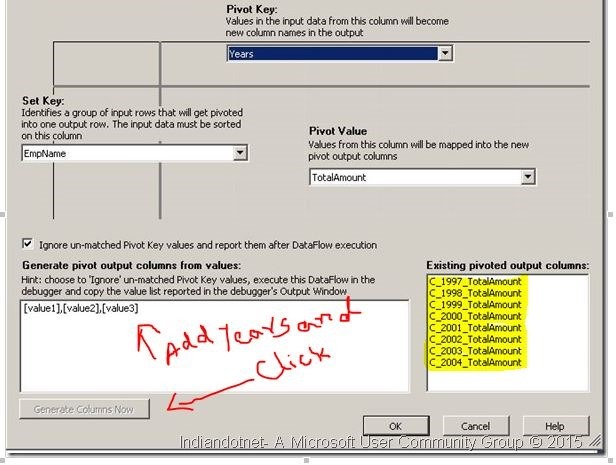 Step 5:- Once the above Step is done next step is click on output column’s BusinessEntityId value. Here you have to set the SortKeyPosition to 1. As highlighted in below screen. 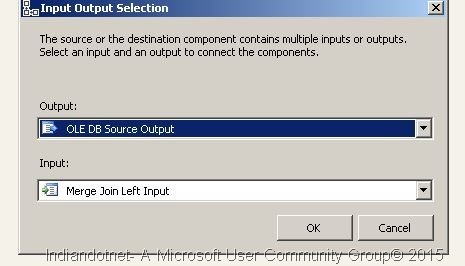 Step 6:- Once you configured sorted input sources then next step is to configure the merge join. So when you click on Edit option of merge join. You will get the following screen. Here if you see, we can configure join type like Inner join, Left outer join, Full outer join. For current example, we are choosing the option “Inner join” and joining key is BusinessEntityId which is primary key in Person table and foreign key in PersonPhone table. Once the configuration is done. 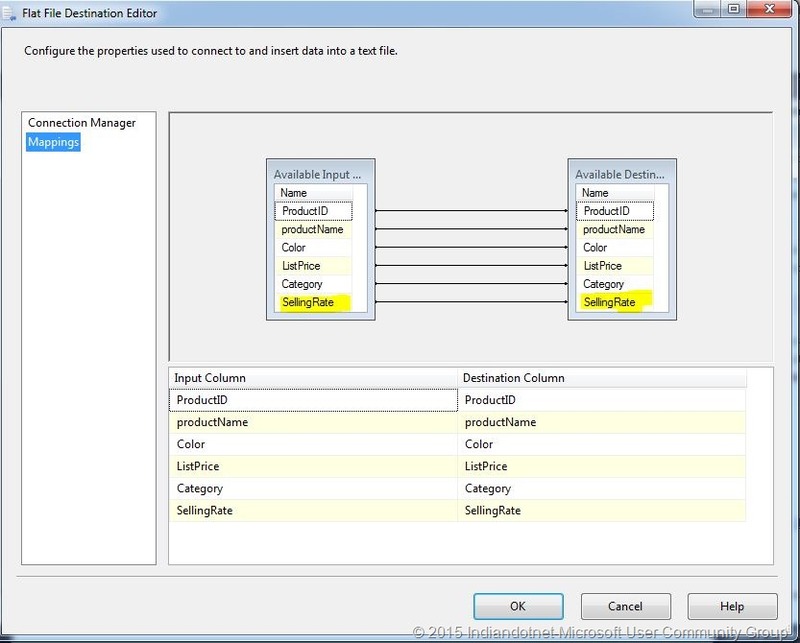 We can select what are the columns which we need as an output. 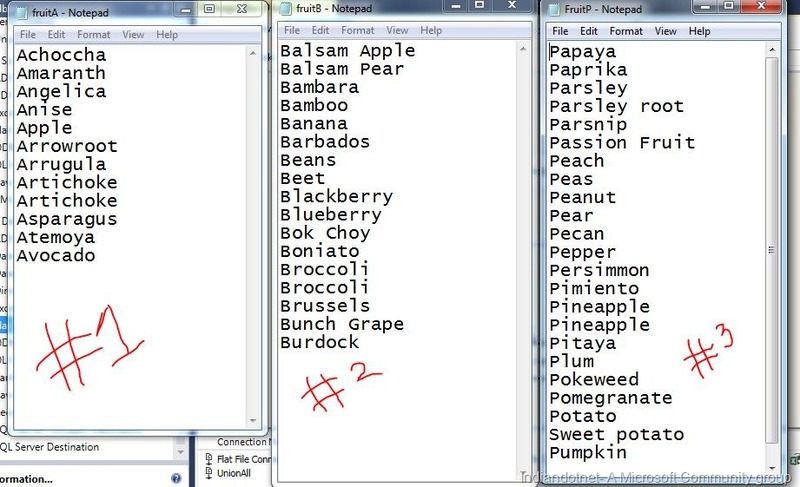 Step 7:- Now, Next step is to configure the output in excel. for this, we drag & drop a destination source. 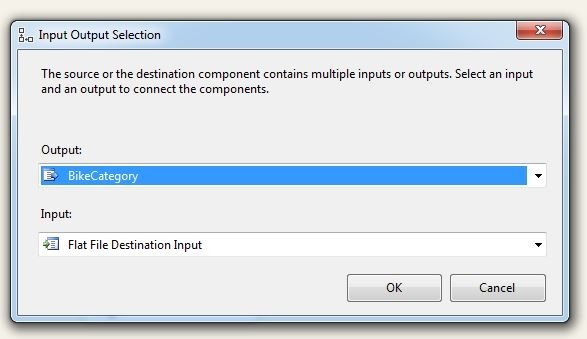 In the current example, we are using Excel as a destination. 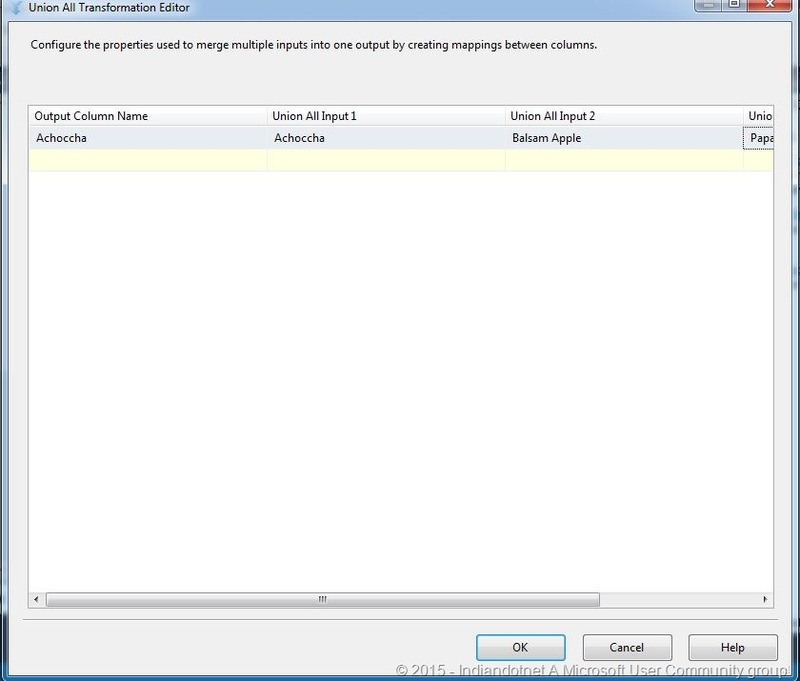 We are mapping the columns of output to excel as shown in below figures. Step 8:- Once, everything is configured. We run the package and if everything is working fine then we will get the following screen. 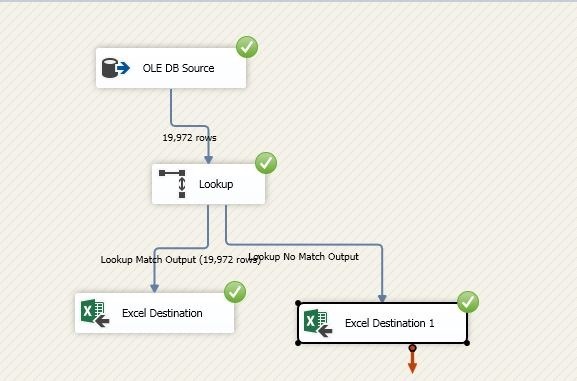 To cross check the result we open the excel and we get the output which we expected as shown in below figure. I hope this article might help you to understand the Merge join. 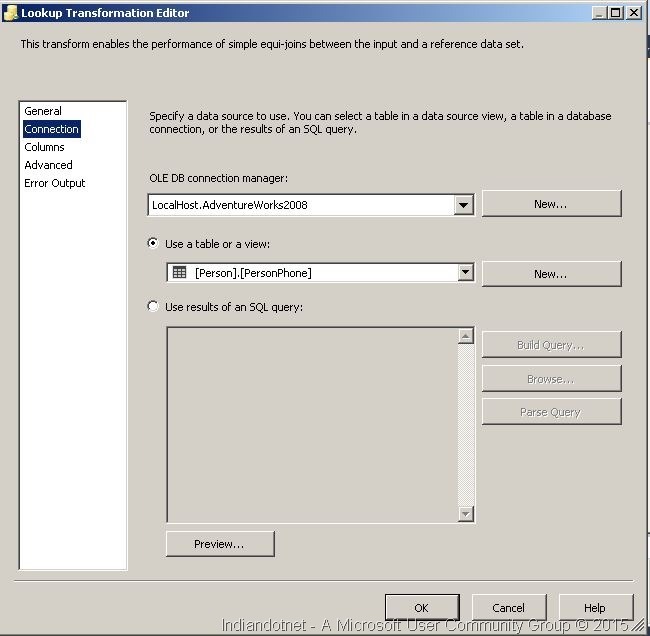 In the series of Zero to Hero in SSIS this is our next post. In this post we will see Conditional Split transformation. I am pretty much sure that by the name you got some impression what it would be. 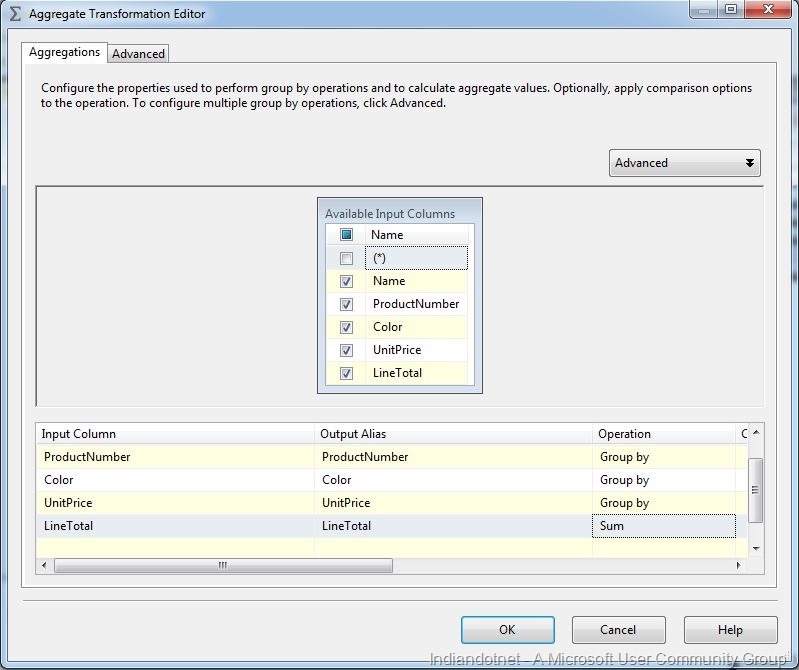 So, a Conditional Split Transformation is a way by which you can conditionally split an input into multiple output. Suppose, You are a food supplier and you cook both veg & non veg food. Now according to orders by client you need to move those order requests to particular kitchen to prepare those orders. Let’s understand it by following step by step execution example. 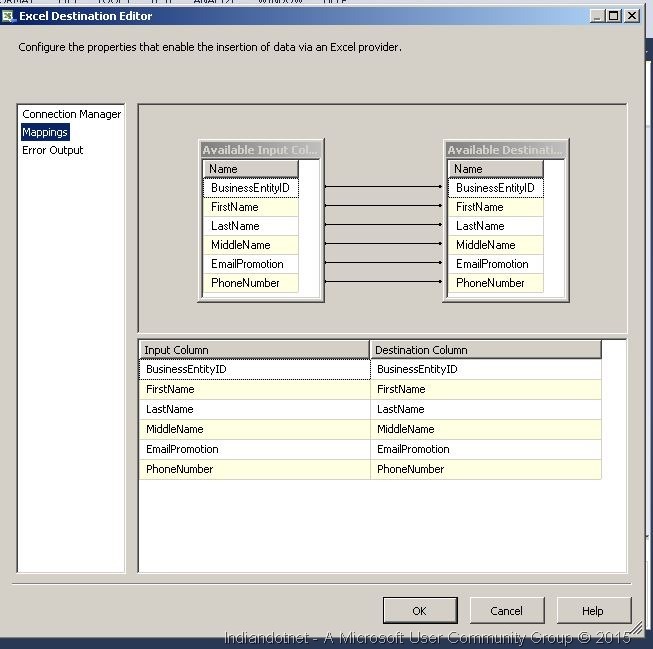 In this example , I am using AdventureWorks database as a source database connection. We are fetching products along with categories. We need Bikes products in different file and rest other product in different file. You can see products with categories shown below in this image Accessories , bikes are the categories. 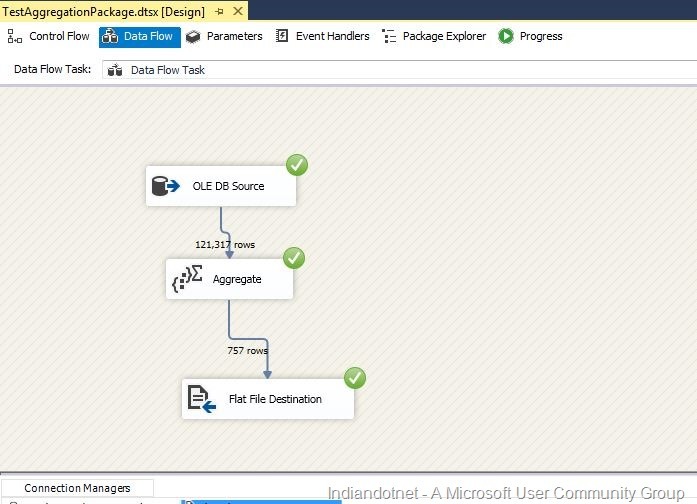 Step 1:- Create a new package and drag drop data flow task control and double click it. 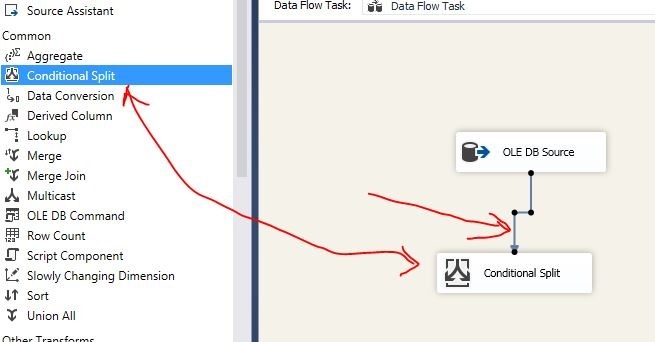 You will get a new screen which data flow task. Now drag drop Source Assistance. 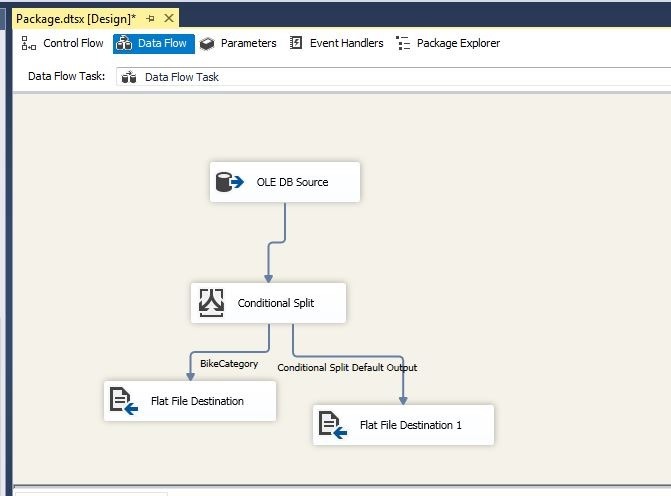 from SSIS controls tool bar. 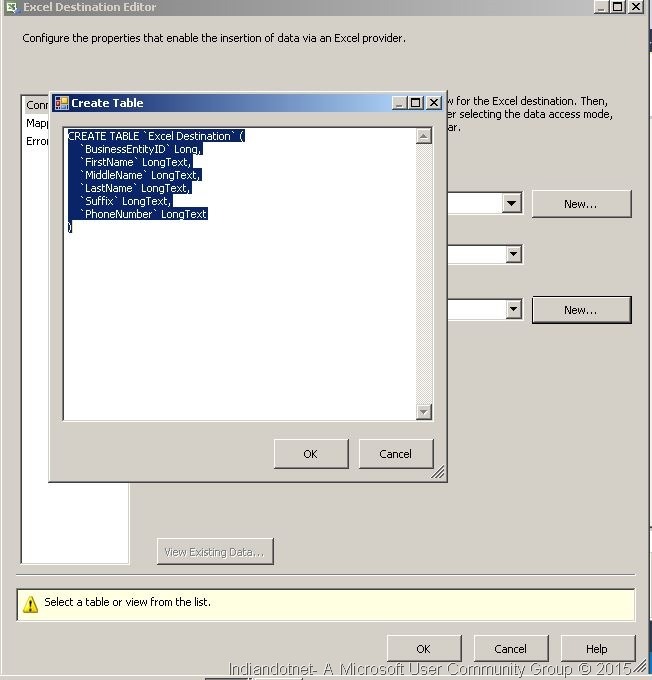 Now as usual we have to configure the database connection string and set the database to adventureworks. 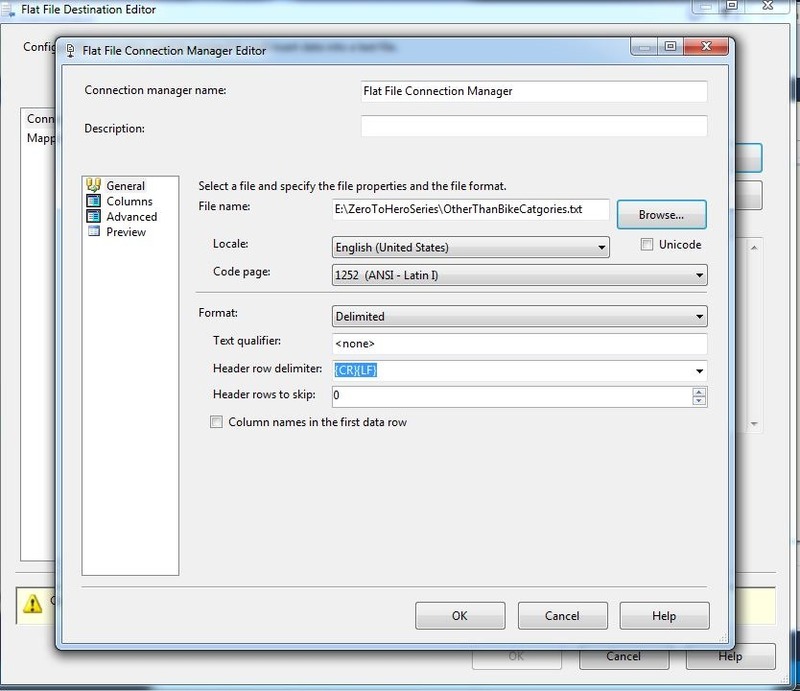 Step 2:- Once the database is configured right click on control and choose edit property. You will get below screen where you need to specify the query which we shown earlier in figure. 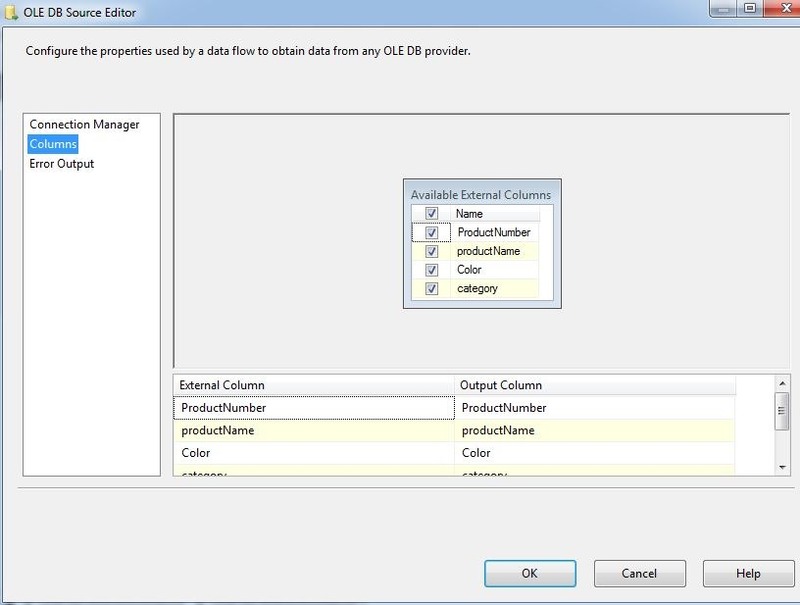 Once you done with above steps you need to configure columns as well so, click on Columns and configure it. 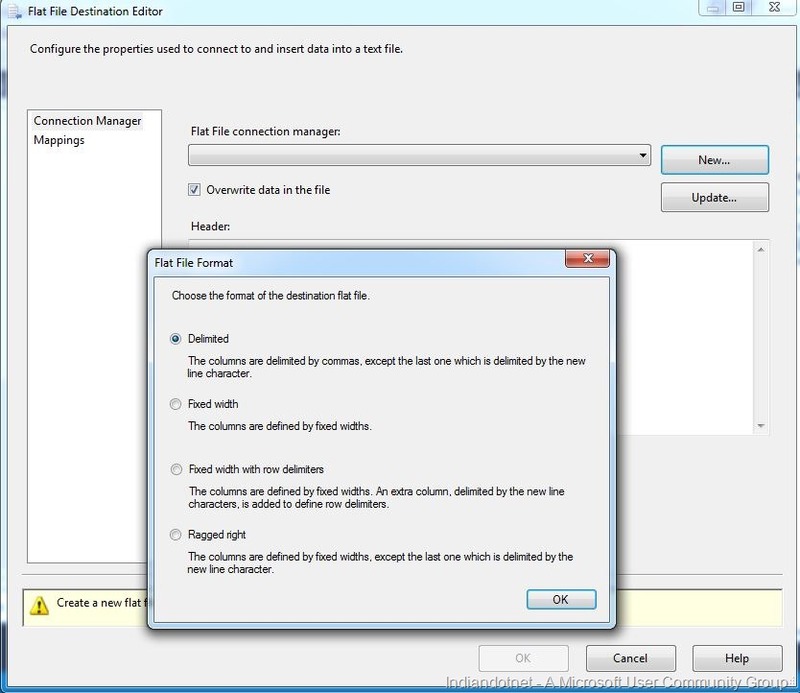 Step 4:- Now choose edit option by right clicking the conditional split and configure it. When you click you will get screen like below. You will find different condition operator. 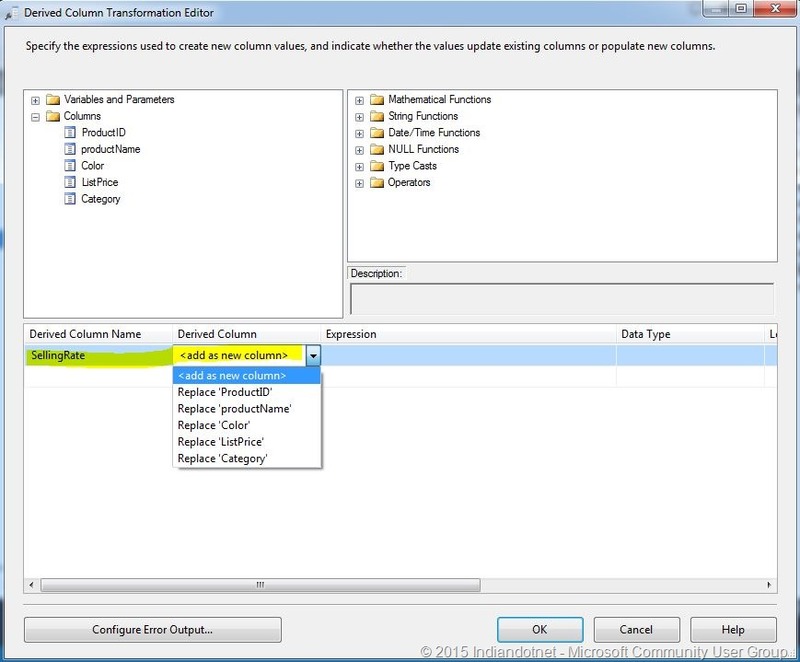 One important point to remember here you need to drag drop column name to condition textbox. As our aim is to have product with Bikes category in a different file and other categories in different file.So we use following condition as shown in below figure. 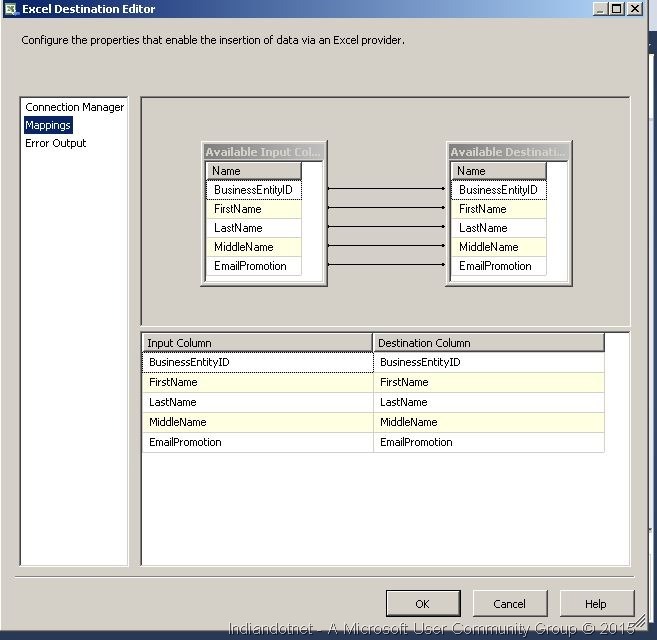 Step 5:-Now drag drop a flat file destination and assign the output of the above conditional split to File destination. You will get following screen. 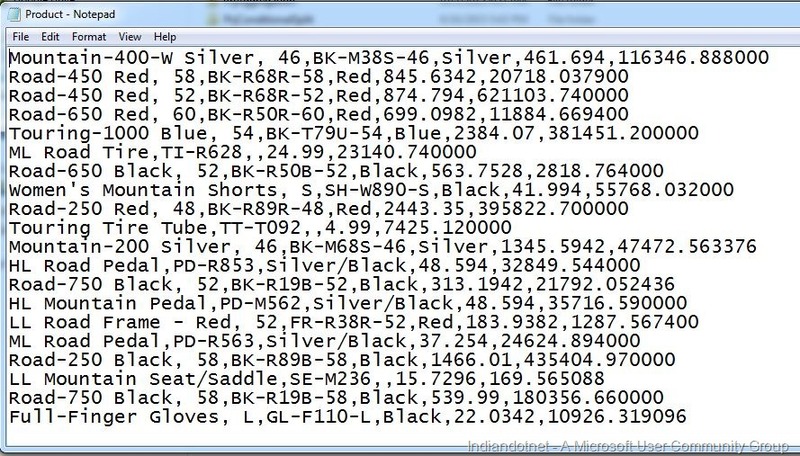 As you see we are assigning Bike condition output to this file which means all the products which belongs to bikes categories should be available in this. 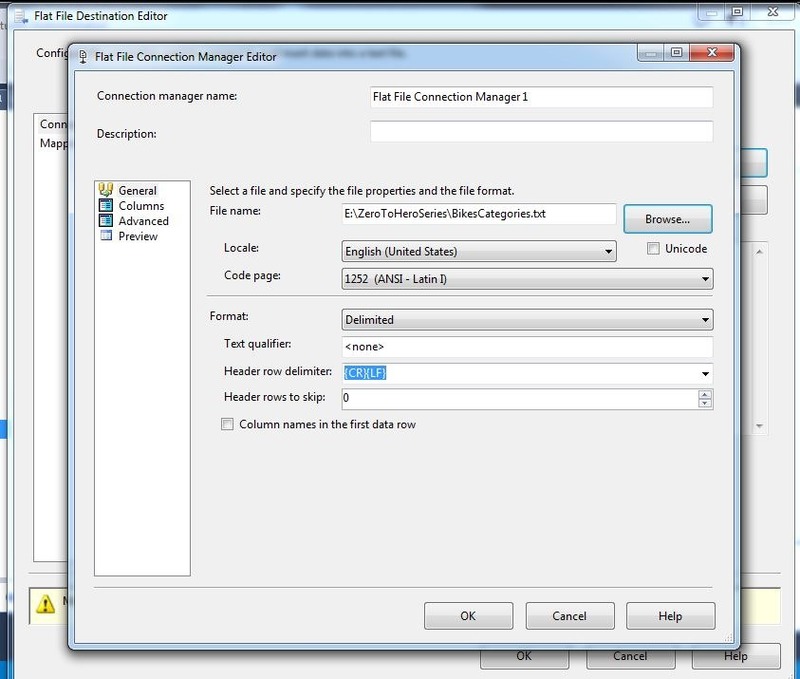 Step 6: Now Configure the flat file destination by choosing the edit option. We almost done here. Now to check whether this conditional split is working or not. To check this hit F5 or run the package. So, if you see below everything working fine. We got 32 rows in bike category and 73 rows in other categories. So , If you go through all the above steps we have achieved Conditional split example. I hope this post might help you to understand conditional split. 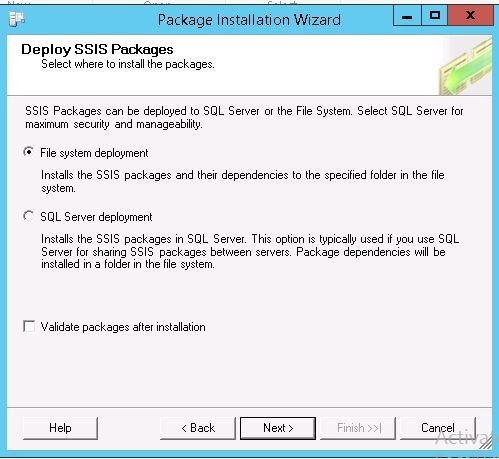 In next step we will go for next step in SSIS. 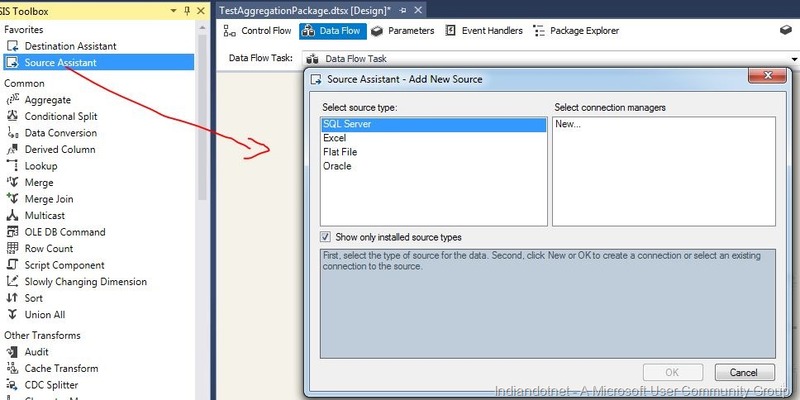 In the series of step by step learning of SSIS this is part #6 in which we are going to learn a new control Data Conversion. I am sure by the name it clear that this control will be use when we require data type conversion of input columns then we need this control. This is exactly same like CONVERT or CAST in our programming. Like DT_NUMERIC is equivalent to numeric data type, DT_I2 is equivalent to smallint, DT_str is equivalent to VARCHAR and so on. I am sure you will find this control fairly simple so without wasting much time lets start step by step. For a change I am using excel data source here. 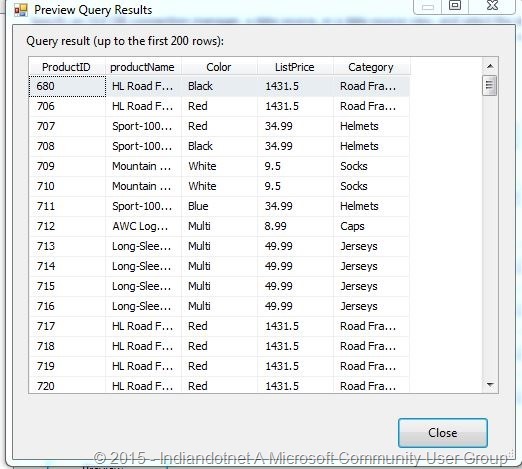 Suppose, we have an excel of sales order which have columns like sales order, subtotal,Tax amount, and freight. 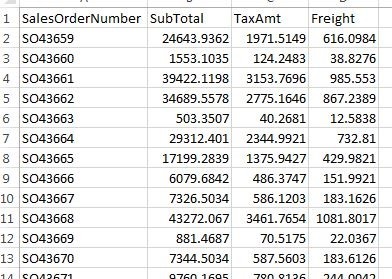 Here sales order is varchar, while SubTotal , Tax amount & Freight are numeric with decimal 4 places. We want to convert the numeric field in integer and want result in a flat file. so let’s start. 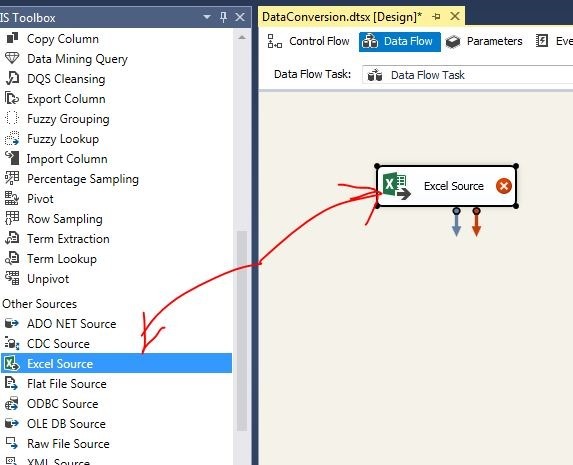 Step1 :- Drag drop a Data flow Task control and double click it. 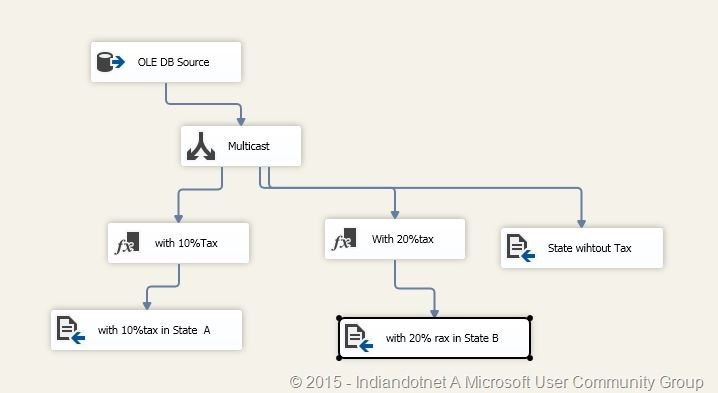 Now add an excel data source from SSIS tool bar as shown in below figure. 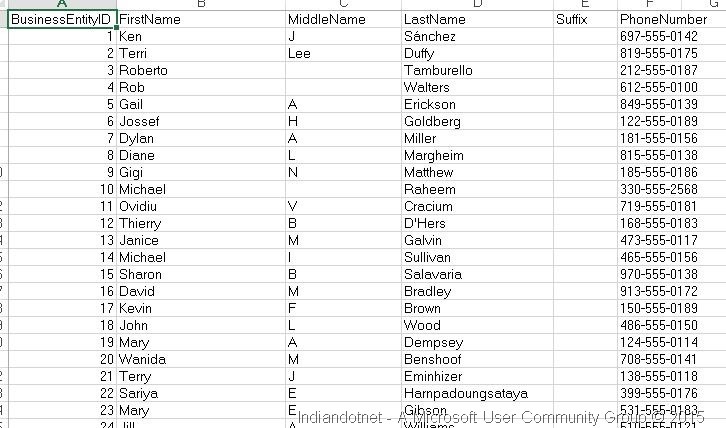 Step 2:- Now next step is to configure this excel source. so to do this just right click and use EDIT option. You will get a screen where you need to provide the file which we want to access. 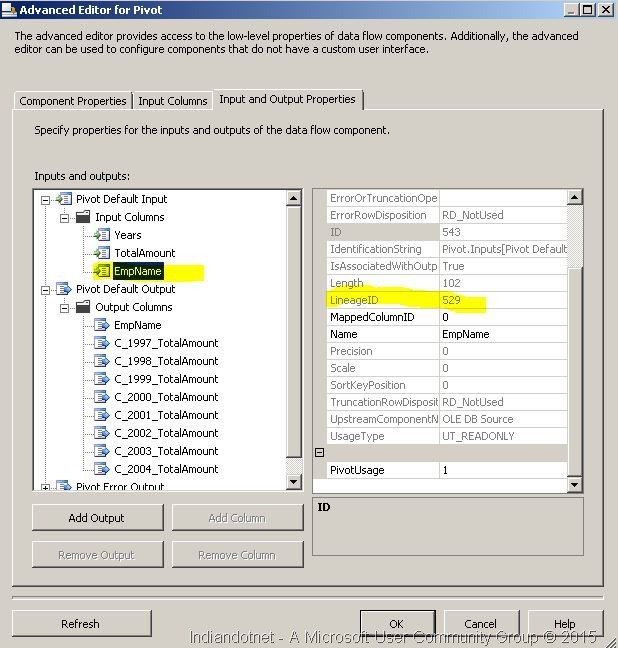 Once the connection with excel is established the Next very important step is to configure sheet as highlighted in below figure. 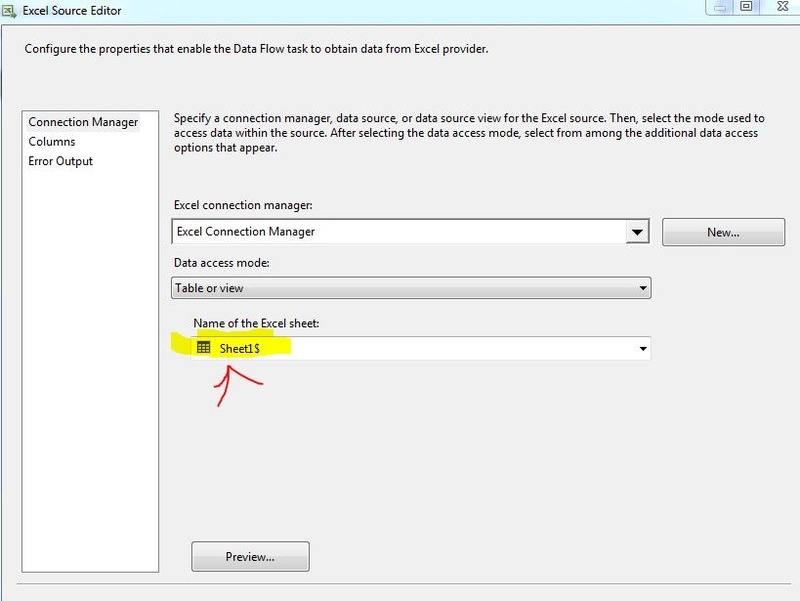 remember you need to configure this sheet because an excel may have number of sheets available so you need to assign proper sheet whose data you want to process. 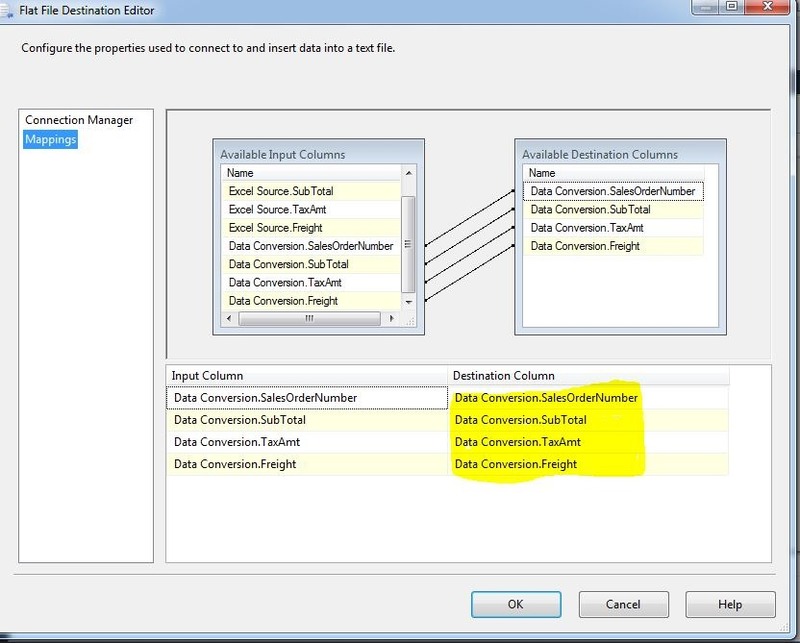 Step 5:- Now , open context menu and click edit button to configure data conversion. Now remember here we have to change data from numeric to integer (As discussed earlier our aim). 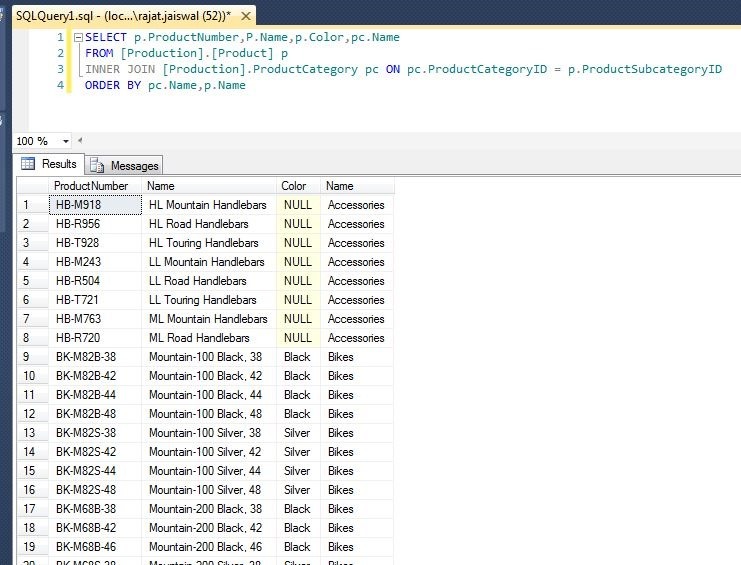 so just change the desire data type which is integer (DT_I4) of all the three numeric data type. As shown in below figure. Also , point to remember here if when you do data type conversion you need to careful about Aliasing also. You will see copy of as a prefix on column. 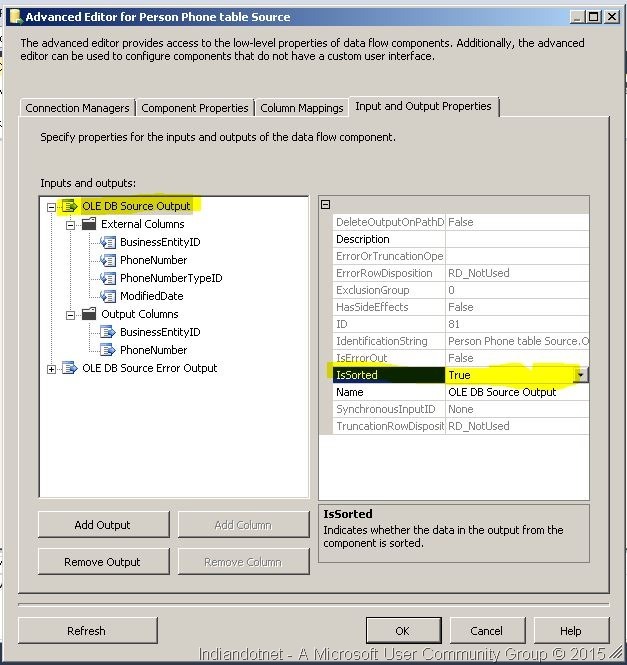 Step 6:- Now, we need this output in flat file so adding a file destination control from SSIS toolbox and configuring it by clicking Edit button as shown in below figure. 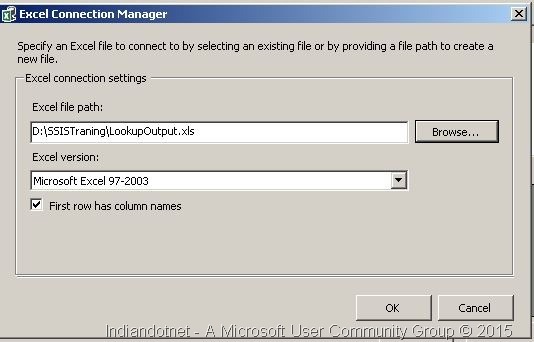 Step 7:- In next step we have to configure the file location and columns which we require in the flat file. And delete unnecessary columns which are not required. Step 8 : Once the above step is done, we are good to go to run this package. So,hold your breath for few second and hit F5 . You will get find below screen. Which shows that all the provided rows are inserted in file. 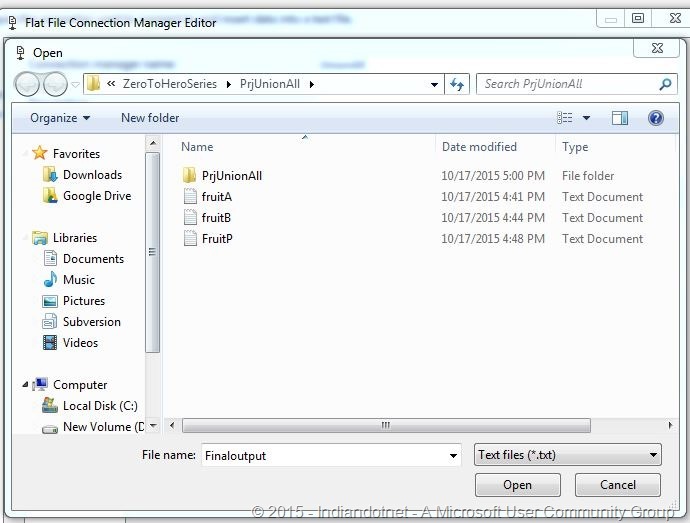 Step 9 : To cross check whether file has integer columns or not lets open it. So, if you see above screen we did it successfully. So we achieved our goal in this post and used DATA conversion control successfully. I hope you feel this post useful. In last post we have successfully created our fist basic package. So, Now the next thing is how to deploy this package. We have created this package for someone else or our client so we need to run this package on his /her machine. Step 2:- Once you click it you might get popup for confirmation just click OK. 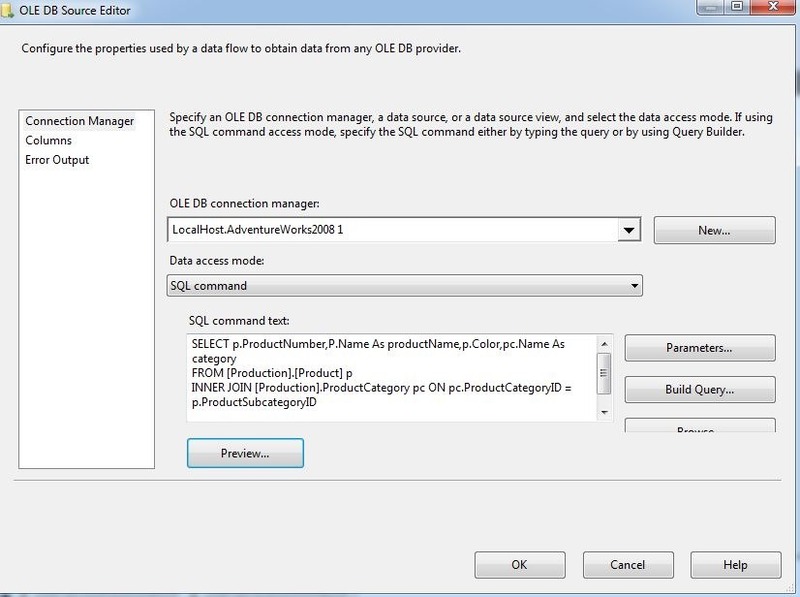 Step 3: Now click on Properties you will get following screen in which you need to select the deployment option. 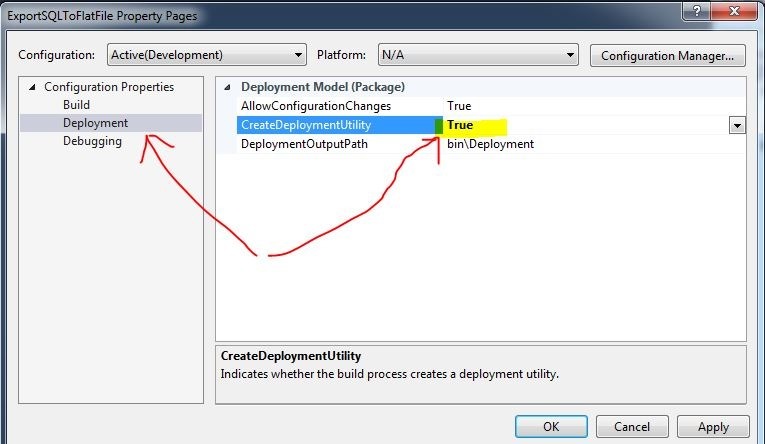 And need to select true value for CreateDeploymentUtility as highlighted below in figure. Once You make this option true press OK or Apply Button. 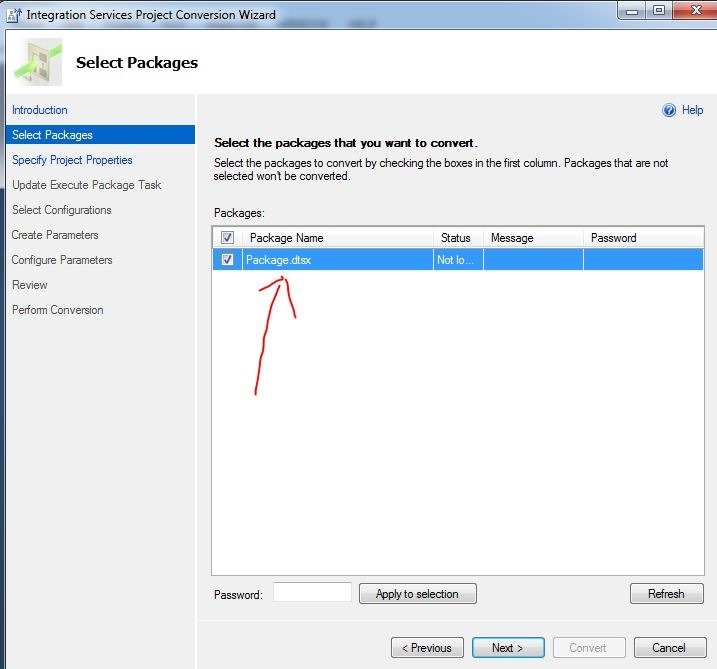 Step 5:- You will get below screen which is package selection screen. 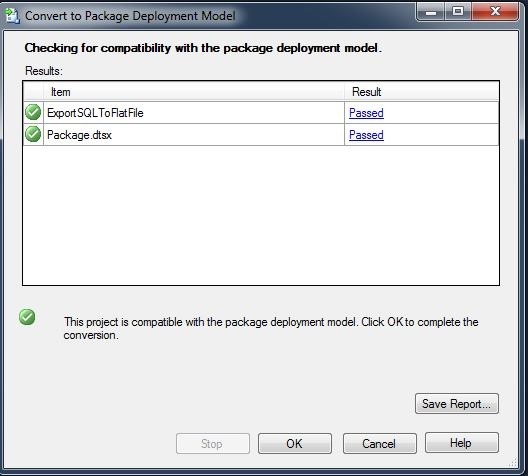 (Suppose you have multiple packages in a solution so for which package you want to create deployment you need to check / Uncheck according to your need.) Once you selected the Package click on Next button. 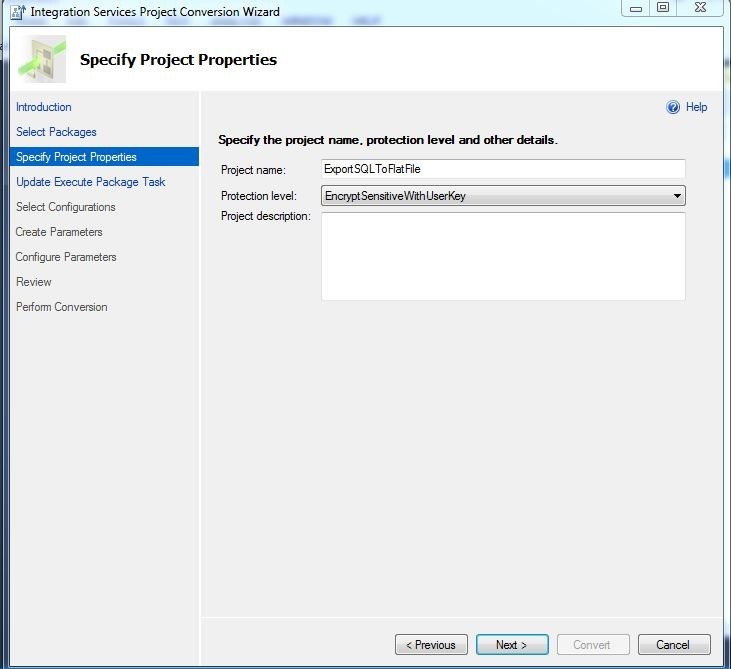 Step 6:- When you click next button you will get next option which is specific project properties as shown below in screen. In this we have an important option which is Protection level. 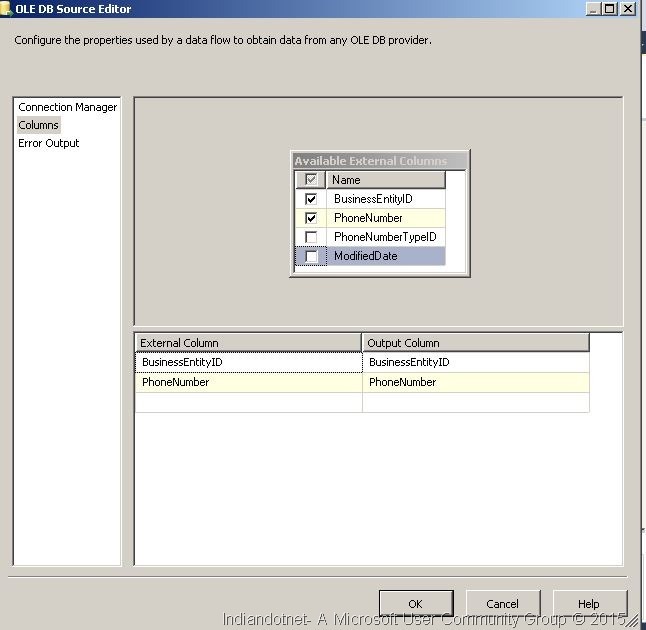 It is use to set the level of showing sensitive data in package. 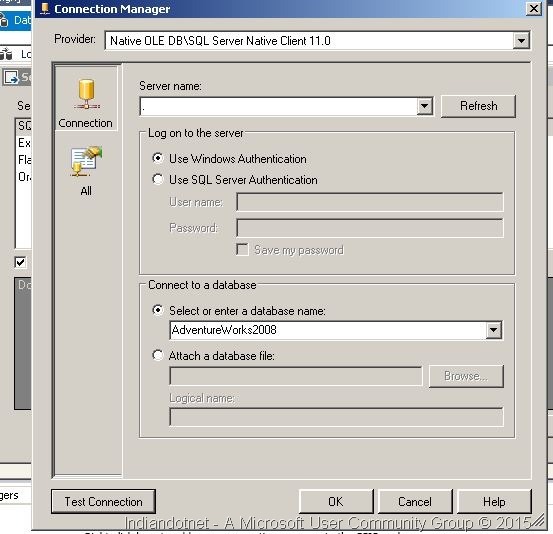 for example a package may contain sql server connection string in which we have username and password and username and password are very important and sensitive information. Here ,with protection level we have option to encrypt this sensitive data or make package password protected. This will be an interesting topic which we will discuss separately in near future in separate post. for current time being just leave the default option as is and click on next button. Step 7:- When you click on next button you will get following screen. 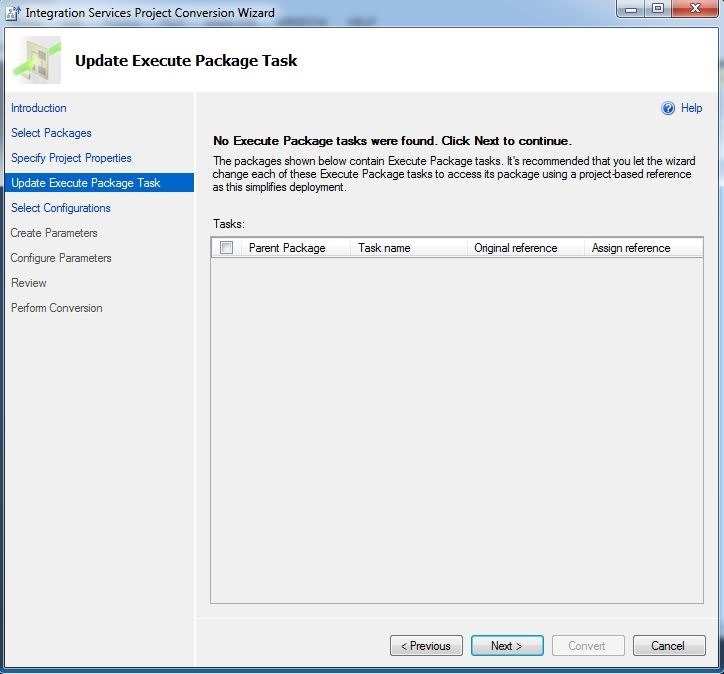 This is the screen where you can call another package which this deployment. We will discuss it later for current deployment process we don’t want to call any other package. Just click on next button. 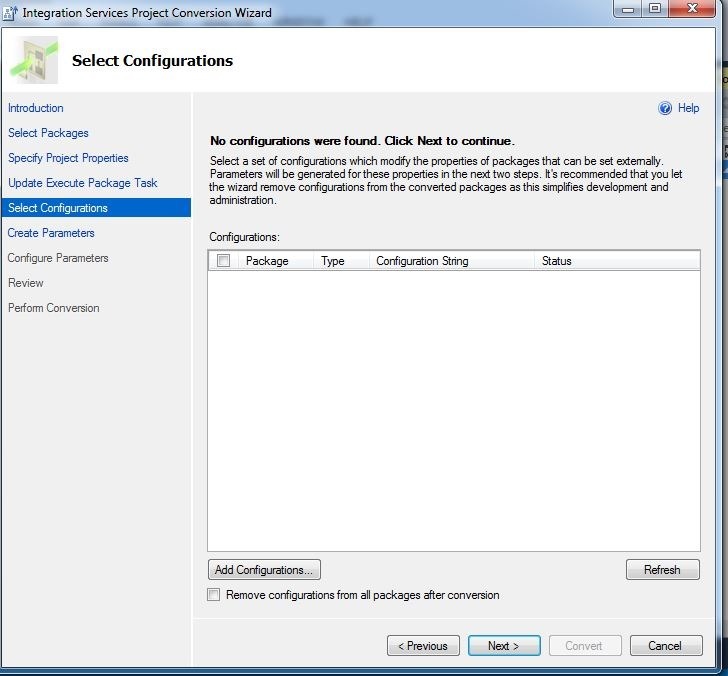 Step 8:- When you click on next button you will get following screen which says about configurations. 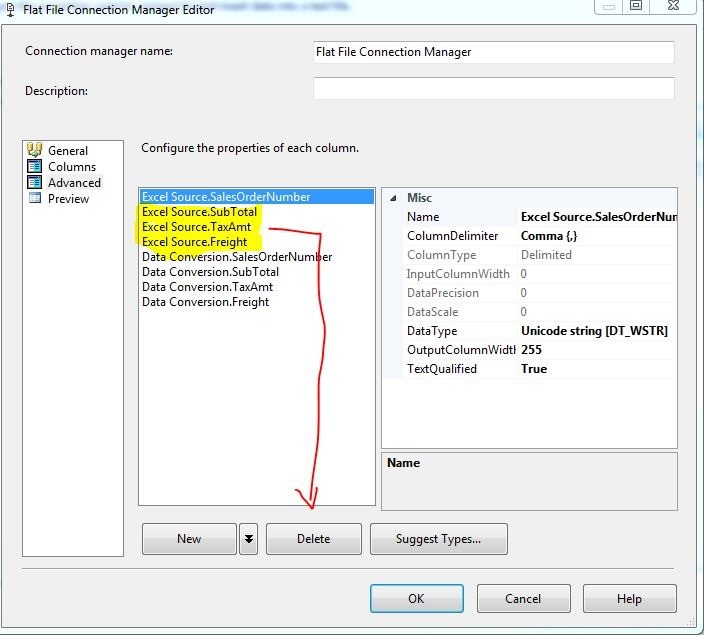 We can create a configuration file which is just a simple XML file. 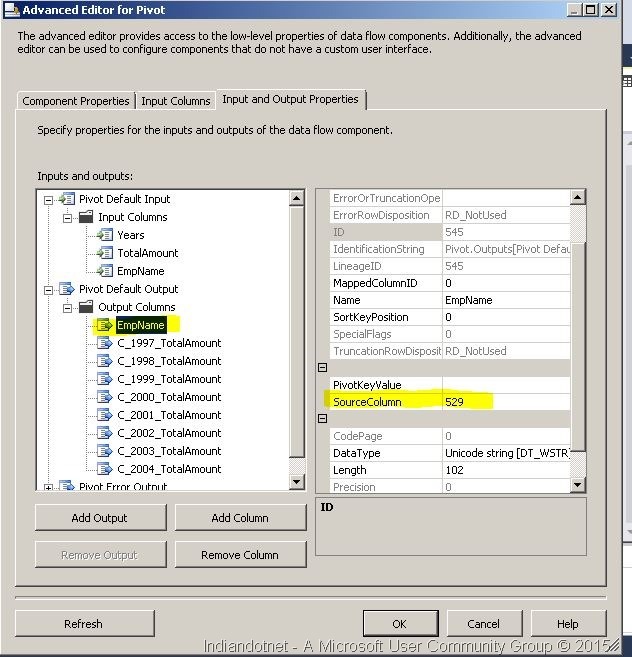 If you are a .NET developer just assume it web.config file where we can keep connection string or other configurable item. 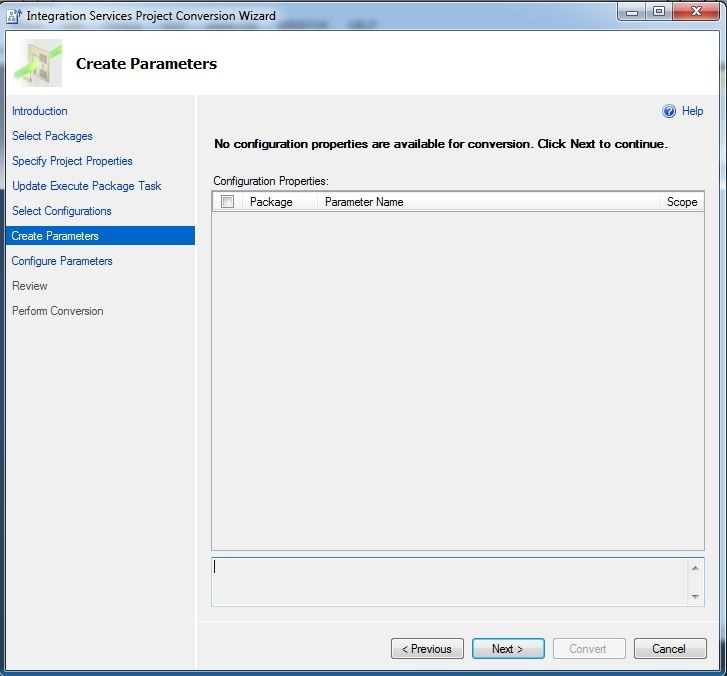 Step 9:- We can create parameters which can be use to pass the values in packages. In current solution we have not configured even parameters so don’t think to much about this currently. We will discuss it separately in coming post. 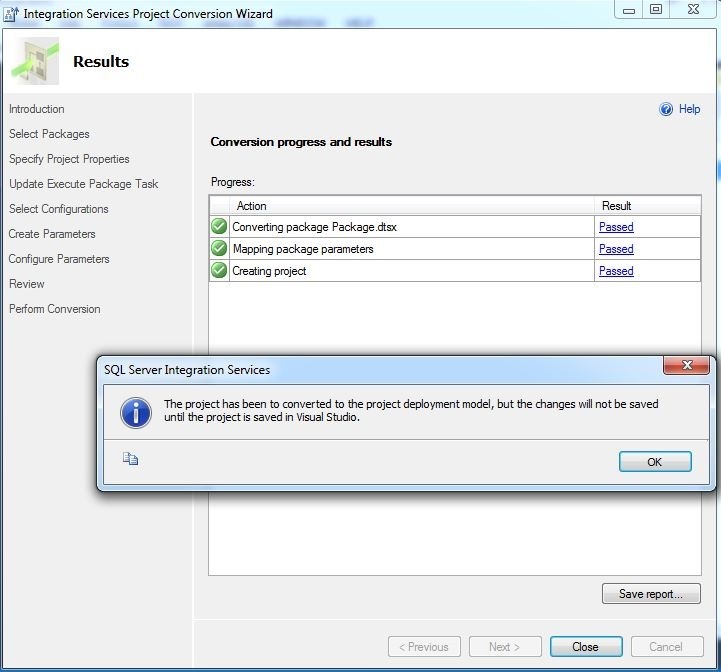 Step 10:- Now directly jump to Perform Conversion and skip review step. and click next you will get following screen of popup. Press OK and then try to rebuild the solution. 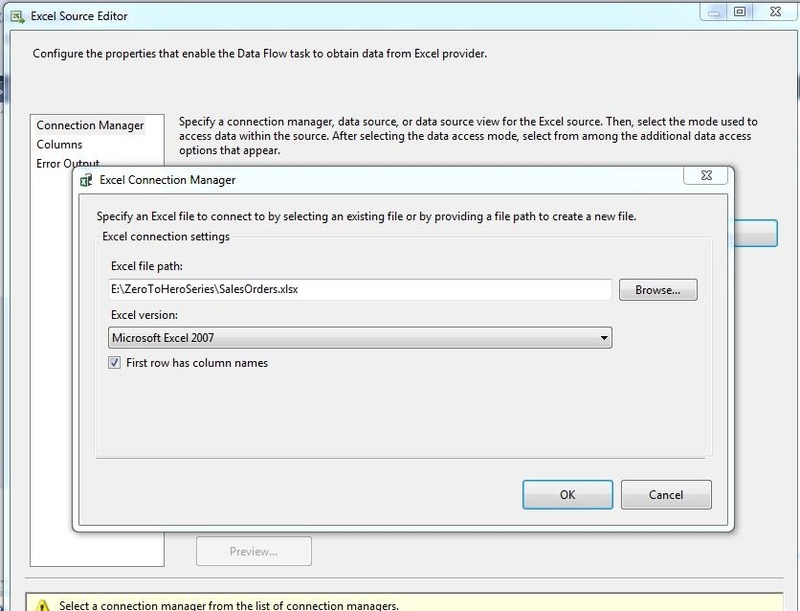 Now for current demo we are using file system deployment and clicking next button. Step 15:- After clicking next button , we will get following screen. 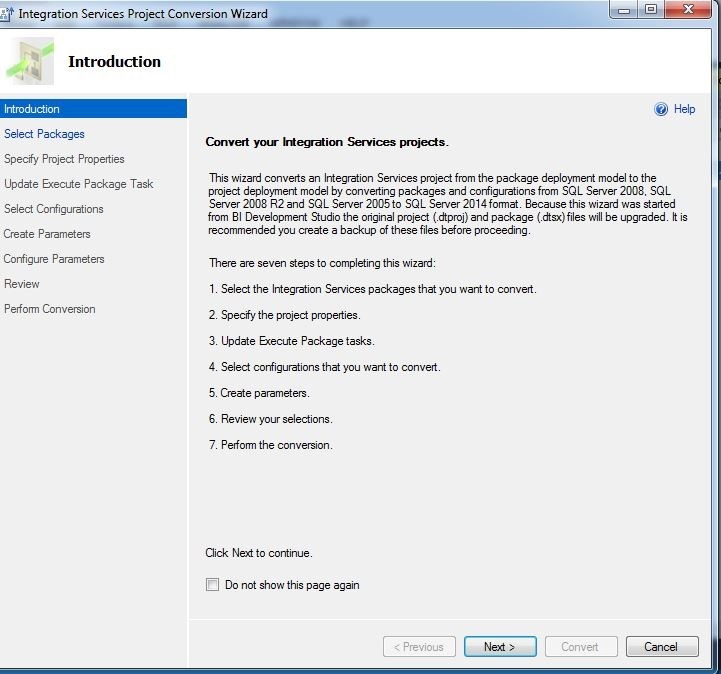 Which is a confirmation screen for deployment. Step 16:- Now the last step click the finish button and we are good to go. 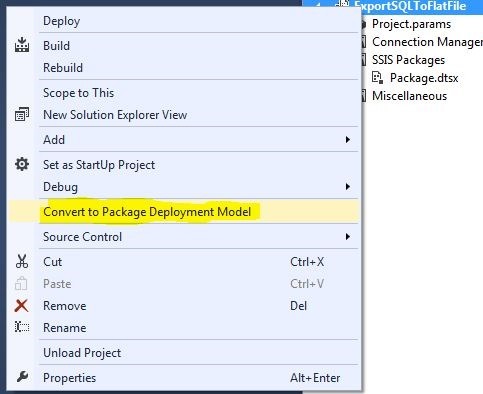 So all the above steps are for creating a deployment for package and then deploy in SQL SERVER. Now , I am sure your next question will be what now ? 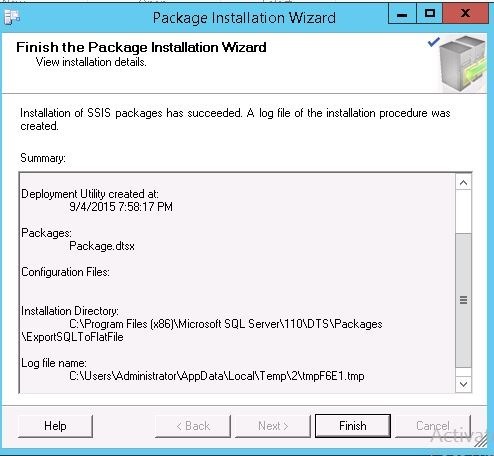 So, now we call this Package in SQL SERVER Job and configure job which execute this package time to time. We, will discuss it more in detail coming post. I hope you will like this post. please do post your inputs.